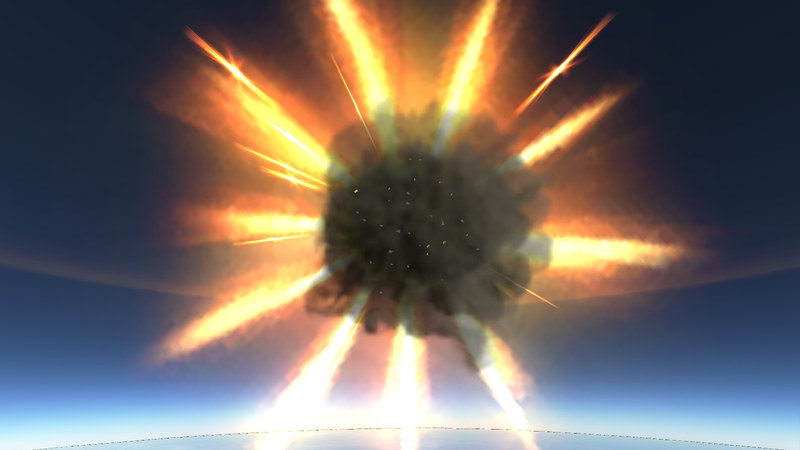 Mission: Provide a nice fireworks display, or maybe send back some valuable data. 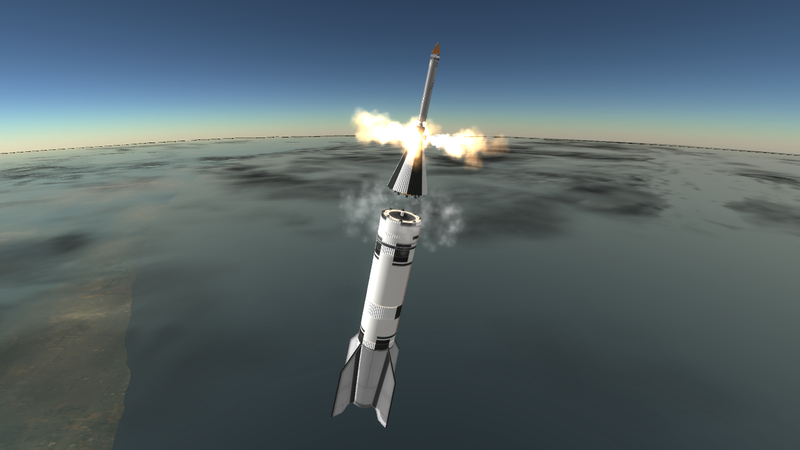 I figured that I ought to start off my RSS craziness with a nice, simple, hot-staged sounding rocket. What could possibly go wrong? 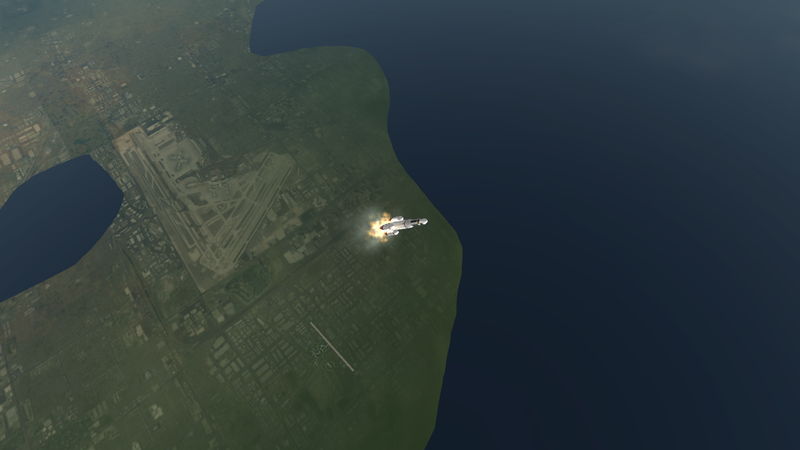 It started off well, and went screaming away from LC - 1 at Cape Canaveral. 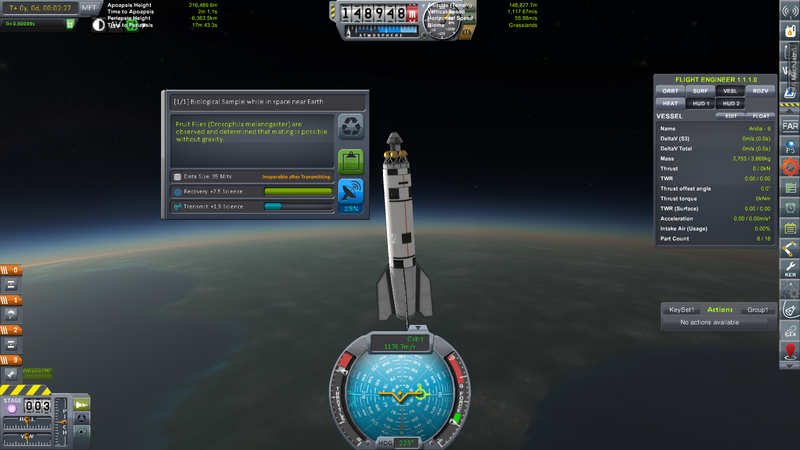 Didn't reach space, but did get more than 85km up, and transmitted science. 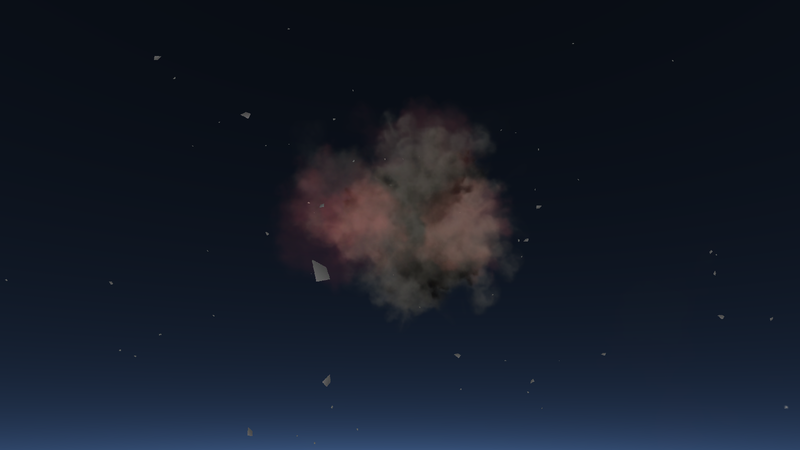 And then it barrelled into the floor at more than 200m/s. 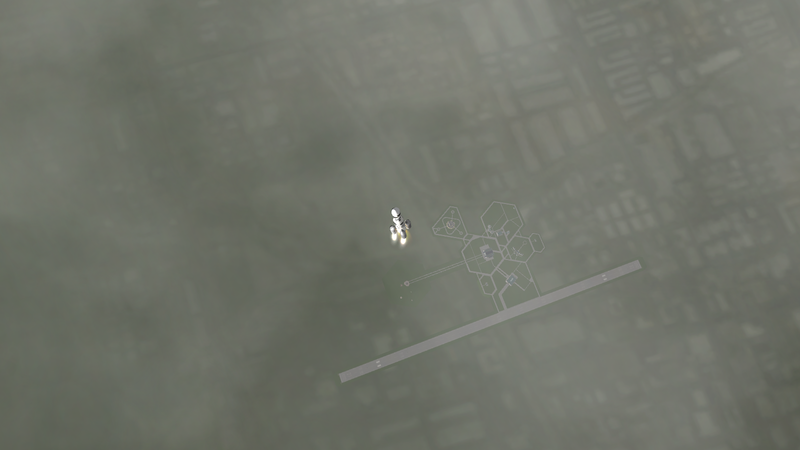 I'd call that mission a total success. 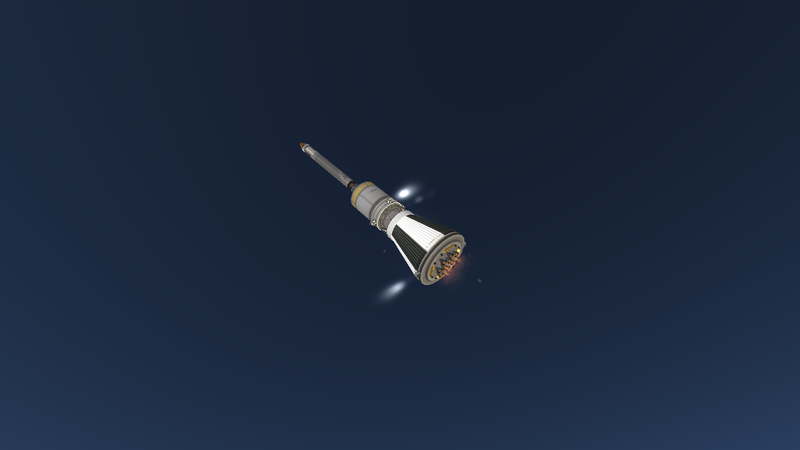 Aridia 2 and 3 were practically identical missions (except Aridia - 3 only reached 61km due to a spin-stabilisation failure), so I shan't bore you with them. 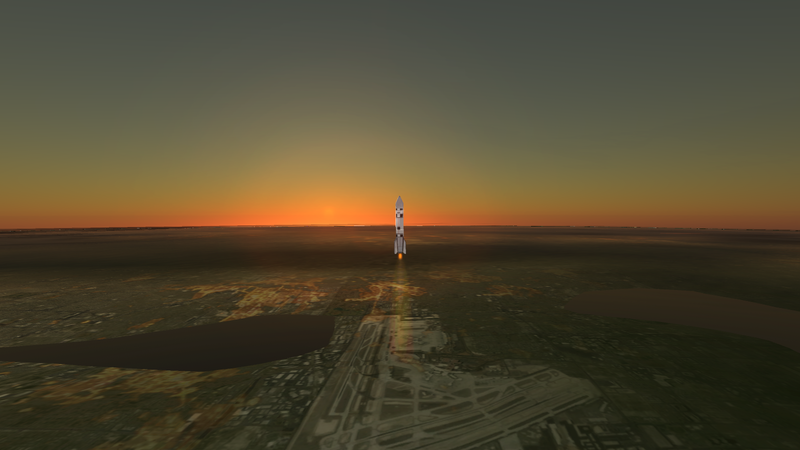 Mission: Get to space, and prove that in-flight staging is feasible. 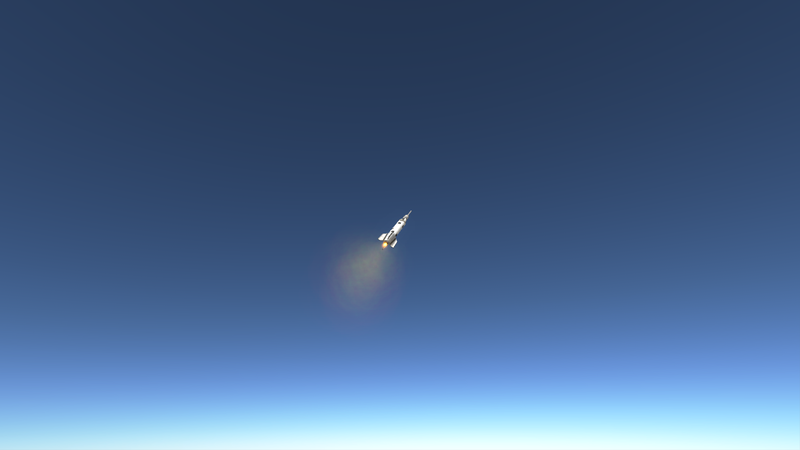 After the early Aridia flights, and two months into the space program, the administrative team decided to try for an actual spaceflight. 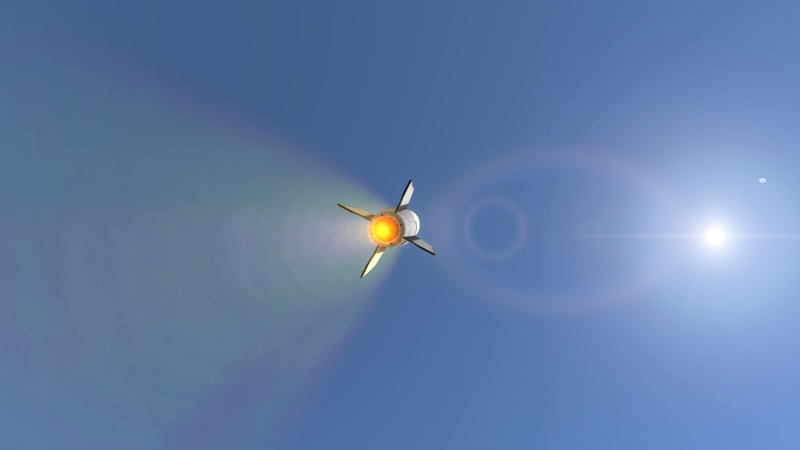 In order to achieve that, the R&D guys begged borrowed and stole some spare V2 missiles and proceeded to violate them with an aerobee-powered second stage. 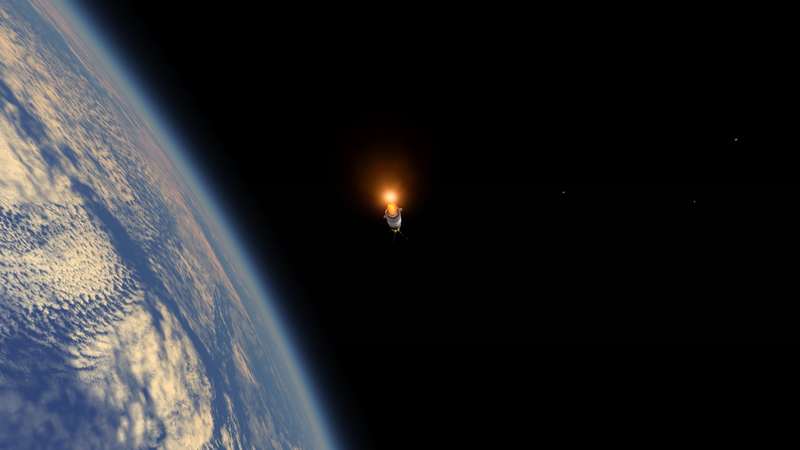 The ethanol fuelled first stage ignited and burned for 70 seconds, placing the rocket on a trajectory with a 200km apogee. 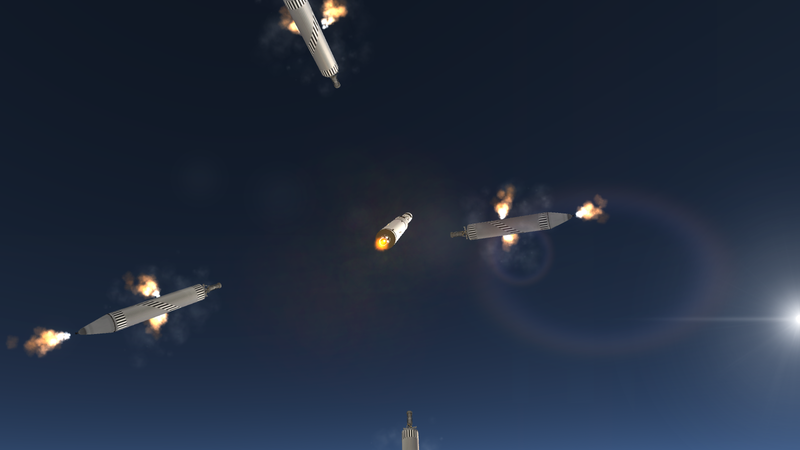 Then, four little SRMs ignited to spin up the second stage. But the engine didn't remain ullaged, and failed to ignite. But, the vehicle did, in fact, reach space, and made it 501km downrange. 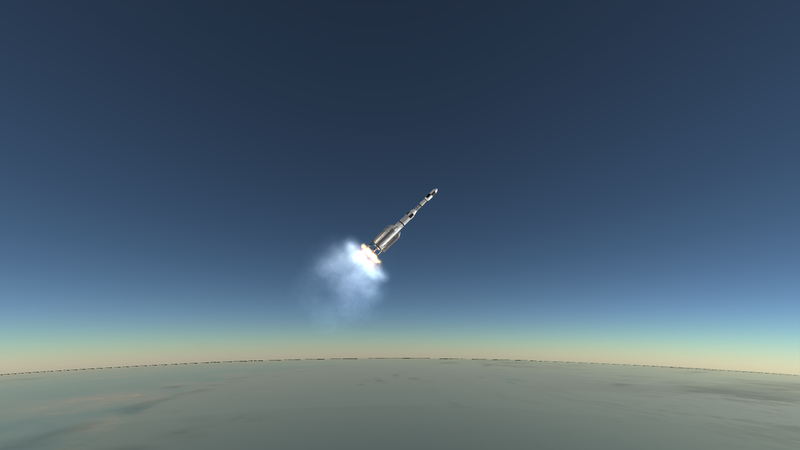 Jebediah Kerman Active P1 KSA X - 3A Flight 1, X - 3A Flight 3, X - 3A Flight 10, Lonetrek - 6. 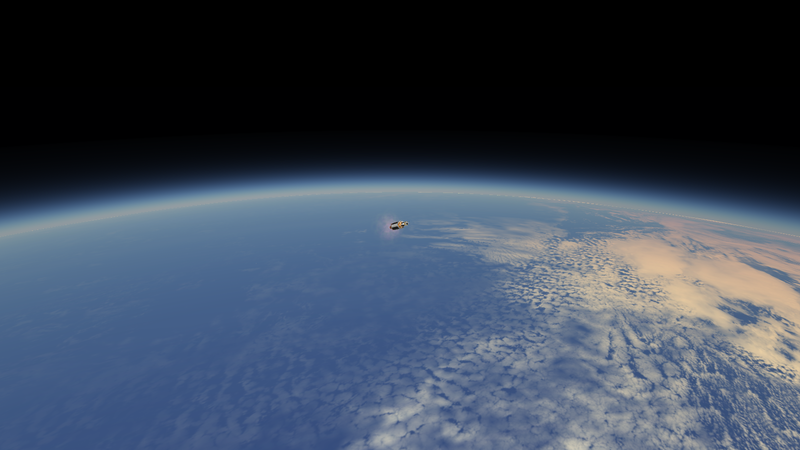 Valentina Kerman Active P1 KSA X - 3A Flight 2, Lonetrek - 7. Bill Kerman Active E1 KSA X - 3A Flight 4, Lonetrek - 8. 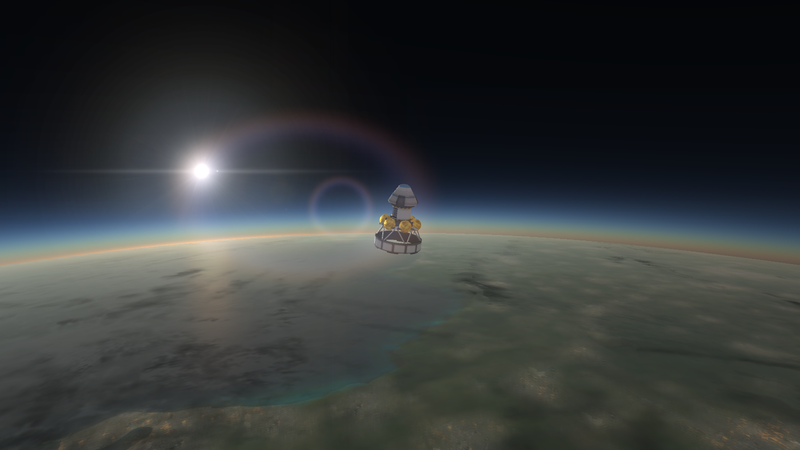 Bob Kerman Active S1 KSA X - 3A Flight 5, Lonetrek - 9. Linda Jordan Active E1 KSA X - 3A Flight 6, Lonetrek - 10. David Bradley Active E1 KSA X - 3A Flight 7, Lonetrek - 11. Katharine Biggs Active S0 KSA X - 3A Flight 8. Maya Stimson Active S0 KSA X - 3A Flight 9. 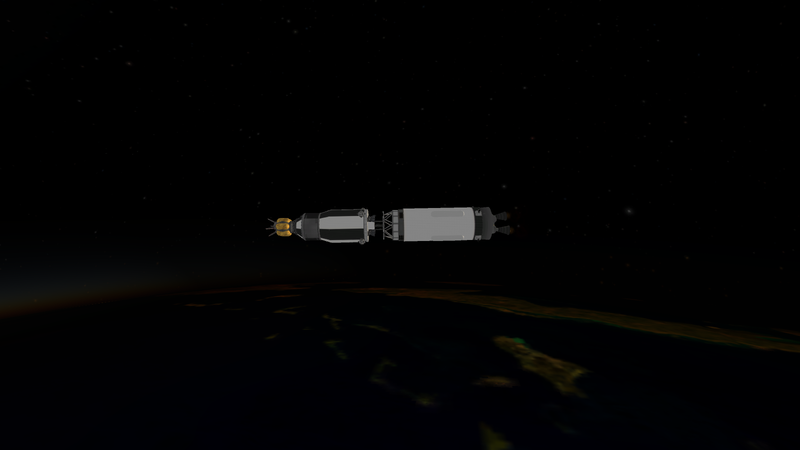 After the partial success of Aridia - 4 earlier in the month, the KSA are re-attempting the mission. 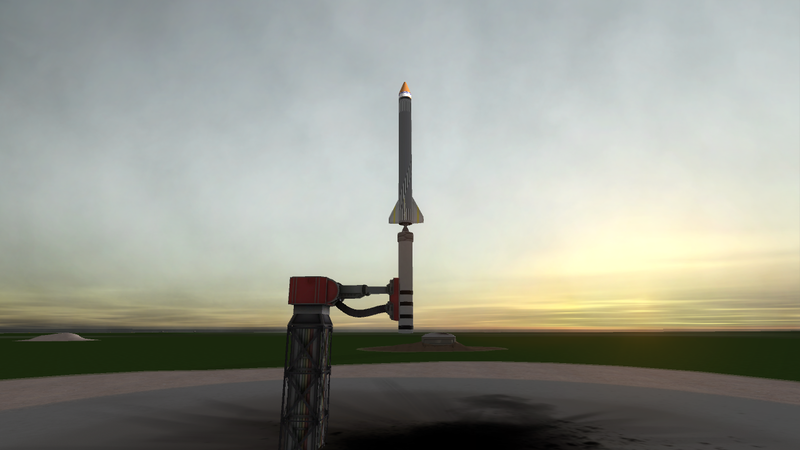 The vehicle is almost identical, with the only change being to the angle of the spin-up motors to keep the Aerobee engine of the second stage ullaged. 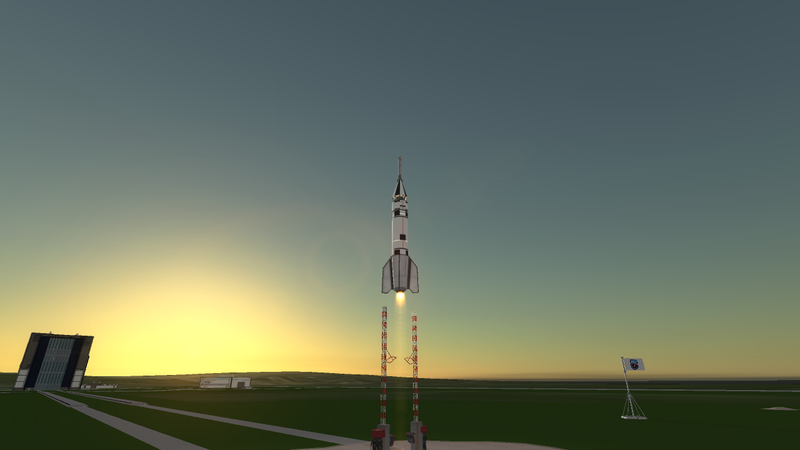 Using the same type of A-4 engine as its predecessor, Aridia - 5 lifted off successfully from LC - 1 at Cape Canaveral. 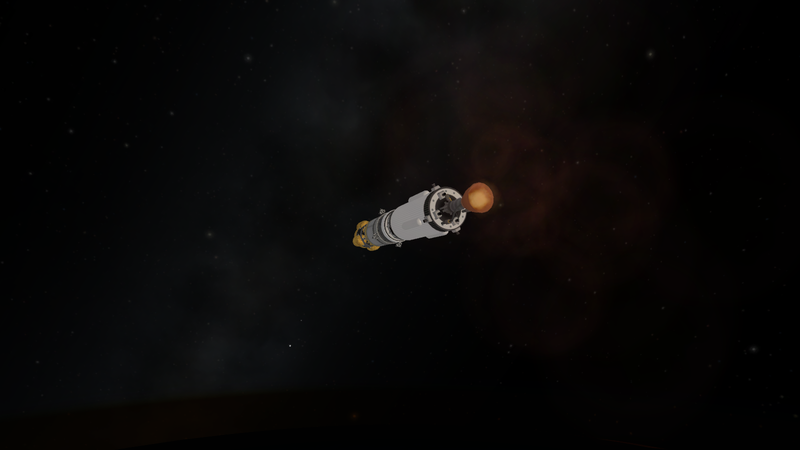 The first stage, as expected, burned for 70 seconds. 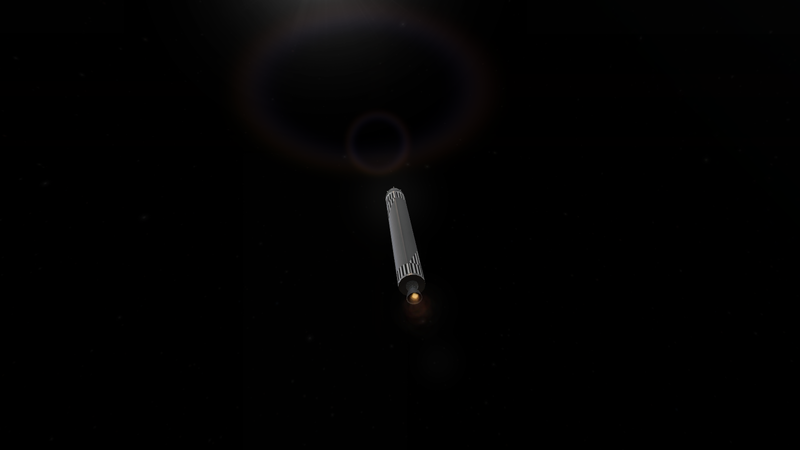 Then, the newly re-angled spin-up motors fired, re-ullaging the second stage, and finally proving that a multi stage, all-liquid fuelled rocket was possible. 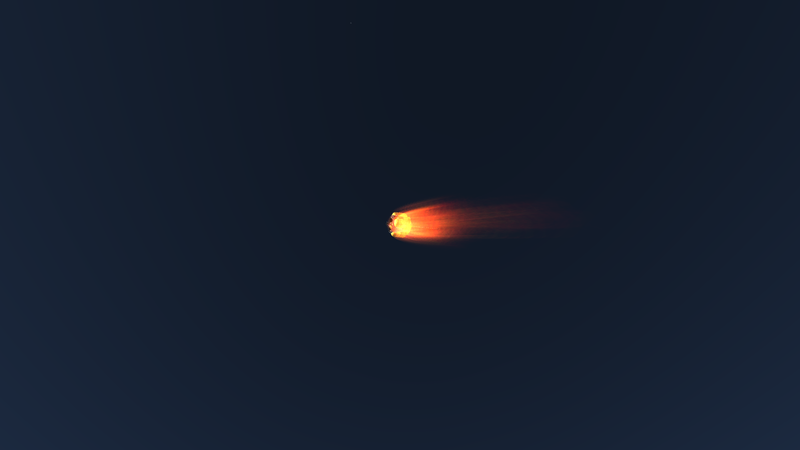 And so the upper stage hurtled off upwards. 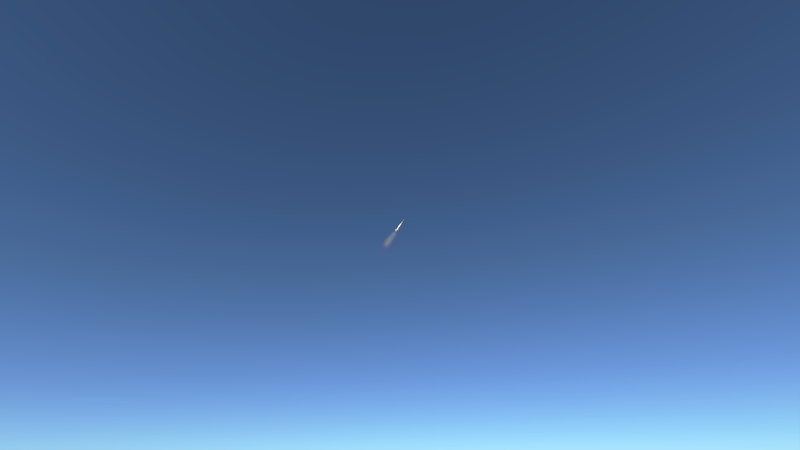 We didn't get any science from this flight, but we did break our own altitude record, reaching an apogee of 501km. 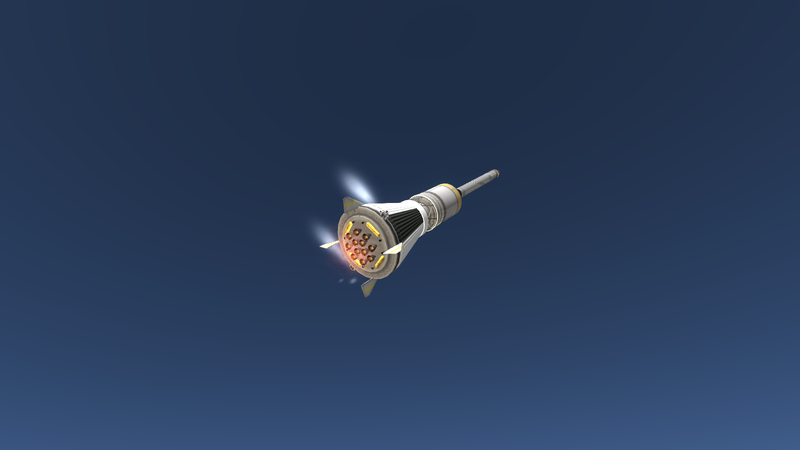 Mission: Break our own altitude record (again) and demonstrate the feasibilty of the new Block A 12 engine upper stage. 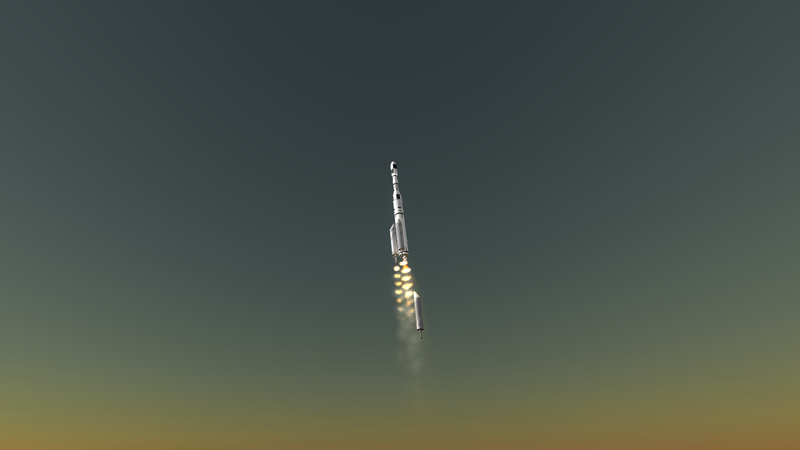 Aridia 6, our first three-stage rocket, and our first attempt at exceeding 1,000km in altitude lifts off from Cape Canaveral. 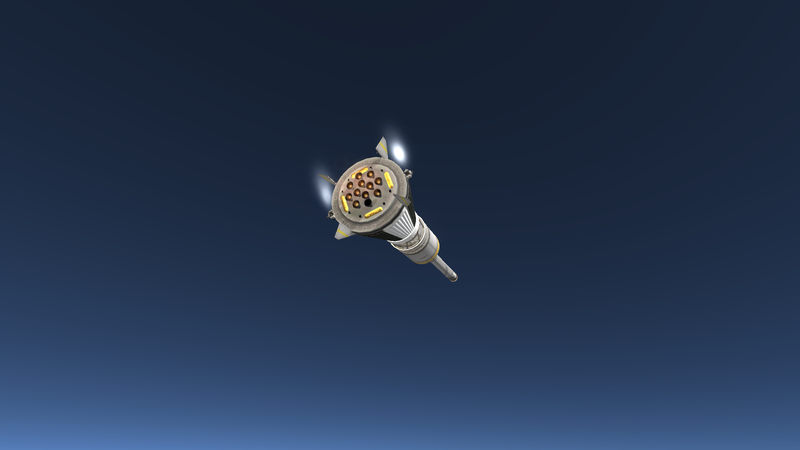 The rocket is effectively an Aridia 2 with the top of the first stage cut off to make a new second stage, which we're calling the Block A. The Block A uses twelve Aerobee engines in order to provide another 2km/s of delta V. To ullage the second stage, we're using a revolutionary new Reaction Control System running on Cold Gas Nitrogen. But, when we tried to ullage and ignite the stage on this flight, we realised that CGN RCS system was nowhere near powerful enough. 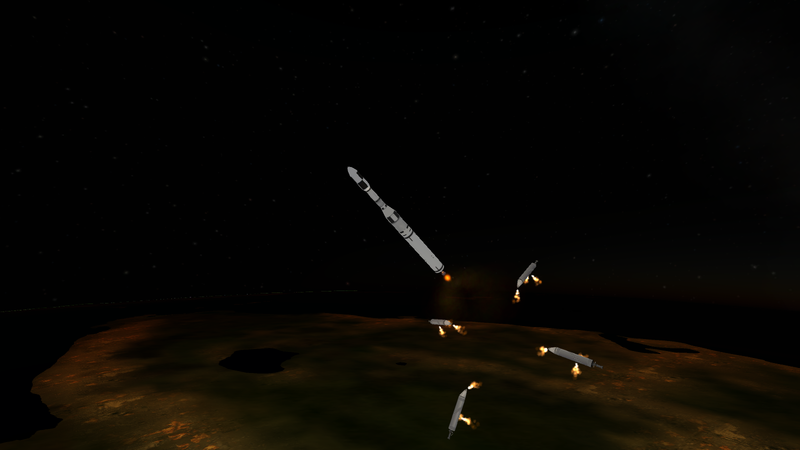 Almost immediately we decided to try it again, but with twice the number of RCS thrusters. 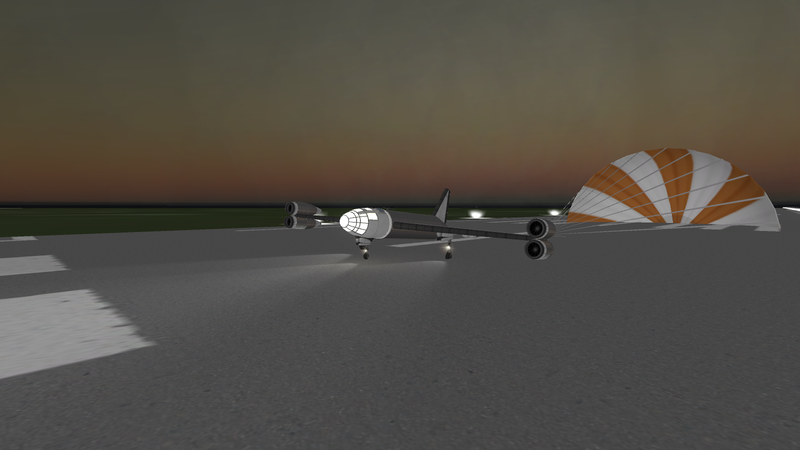 The A-4 engine failed after just 24 seconds, but we managed to ignite the Block A. And then one of the Aerobees failed. Sorry I've been neglecting this for the last two weeks, I hit a fairly low point, visited the doctor, got bounced around various medical professionals and the school system, and, to top it all off, I was diagnosed with a veritable shopping list of mental illnesses. So I'm sorry if I randomly disappear occasionally. Until next time, though, I'll be playing catch-up. Mission: Finally succeed where Aridia - 6 and 7 failed. So, here we go again. Trying to exceed 1,000km in altitude. Basically a re-run of Aridia - 6 and 7. 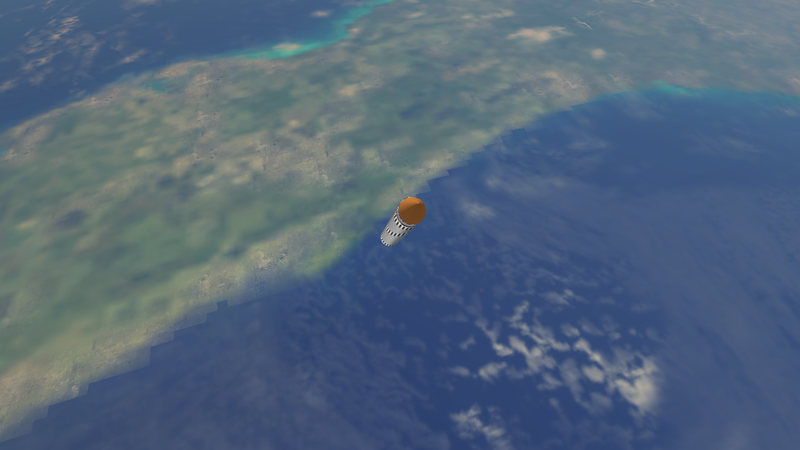 Successful separation of the Block A second stage. Aaand an Aerobee has failed. Should I have expected this after last time? 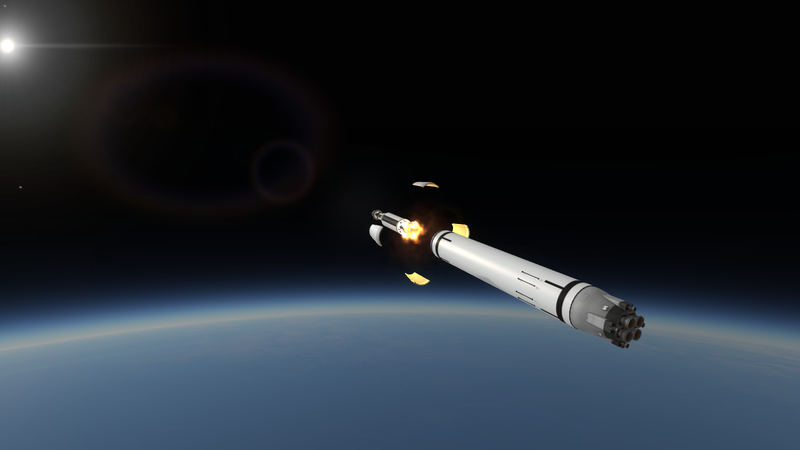 But, by some form of divine intervention (AKA spin-stabilisation), we made it to SECO, and fired the third stage. And by doing so, we achieved an apogee of 1,511km above sea level. Mission: Try for orbit? Maybe? It has been decided, after the resounding success of Aridia - 8, to begin, with immediate effect, a programme to place a satellite into orbit by the end of 1953. 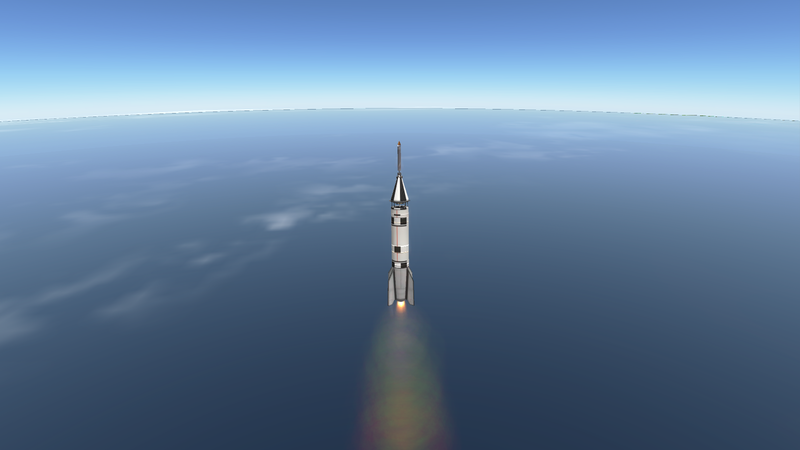 Our first approach to the challenge is basically an extension of the Aridia programme, using a four stage version of the Aridia Launch Vehicle with a Star 37 Solid Rocket Motor as the third stage. 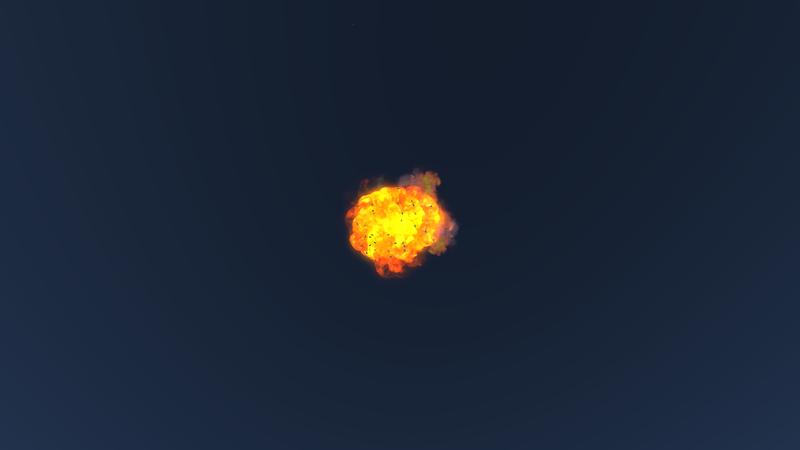 As expected, the first stage burned pretty much flawlessly, and was cut free. 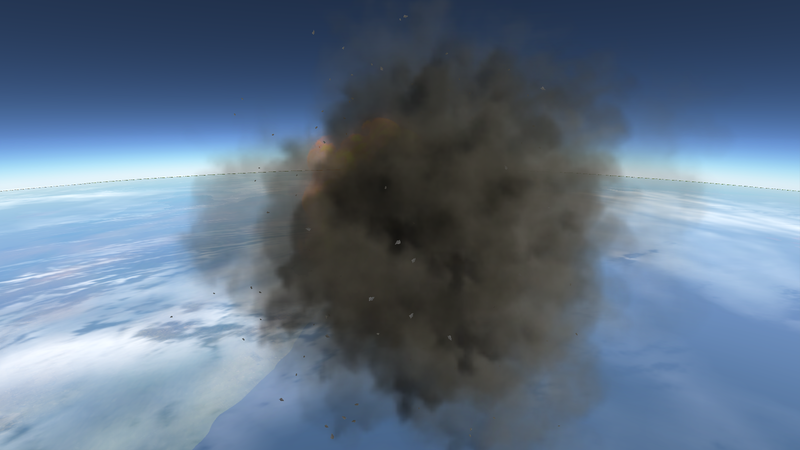 We then realised that the Cold Gas Nitrogen RCS was nowhere near powerful enough. Again. We really ought to address this. We managed to light the stage, but it entered a length-ways spin. So we range safetied it. 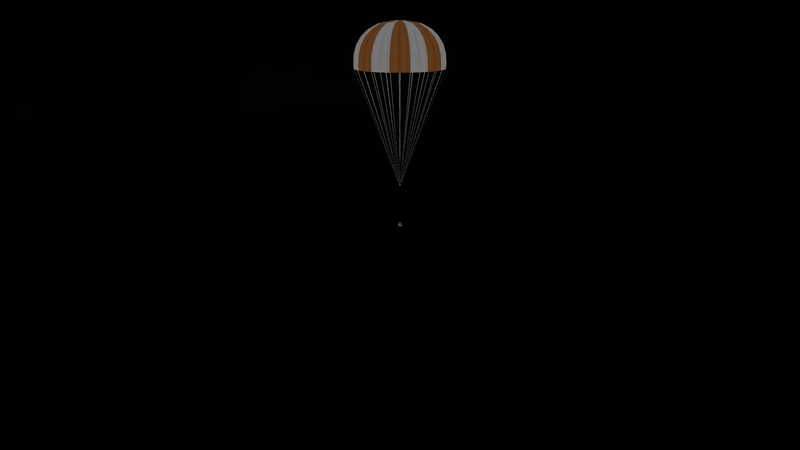 Mission: Fly some Fruit Flies to space and return them safely to Earth. Today is the day. It's time to try and fire a living organism into space (and return it safely). Ooh, pretty sunset. As per usual, we're continuing our A4 addiction. Today, there will be no gravity turn. We're flying straight up. And there it is. The little capsule, containing our dedicated little explorers. Or perhaps not so dedicated. I'll give you guys a bit of space. A bit of SPACE, get it!? Alright, I'll stop with the punning. And, by some miracle, everything goes off perfectly, first time round. Now there's a rarity. Mission: Break the sound barrier. 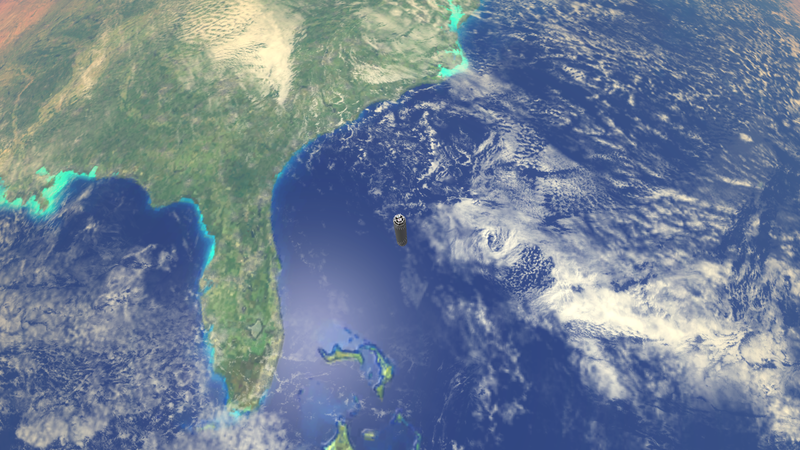 There's been a little development going on behind the scenes at Cape Canaveral. 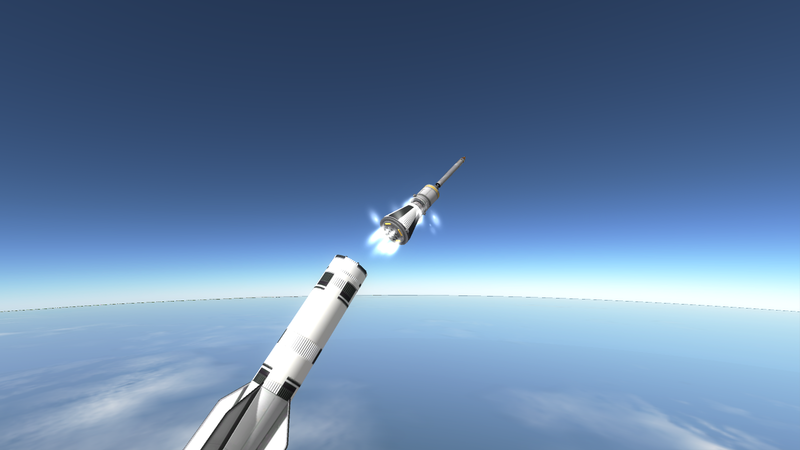 As well as firing rubbish into space, we've been building aircraft. 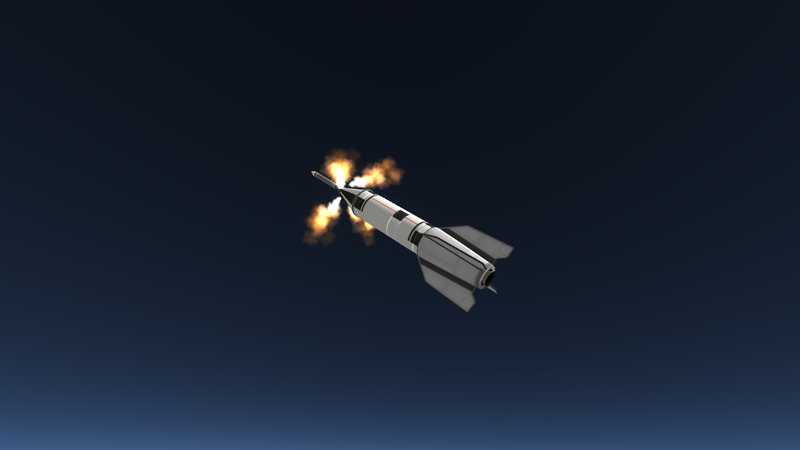 This little thing is the X - 2, a stubby little rocket plane, powered by a single XLR-11 throttlable rocket engine, fuelled on Ethanol 75 and Liquid Oxygen. 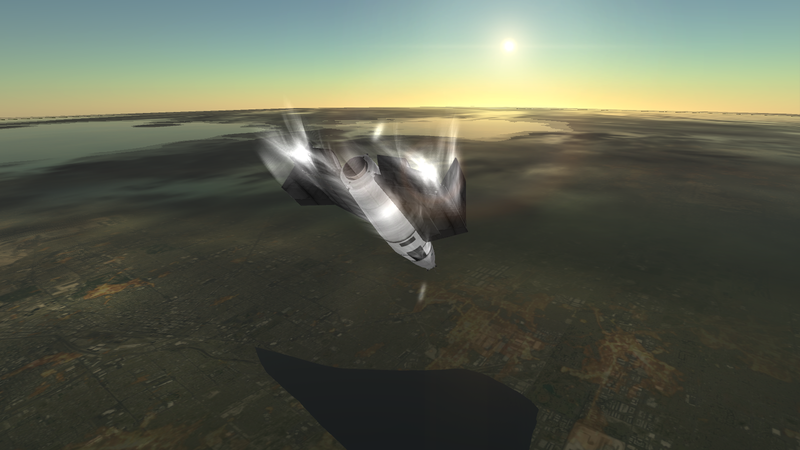 The purpose of this flight is to, for the first time, break the sound barrier. 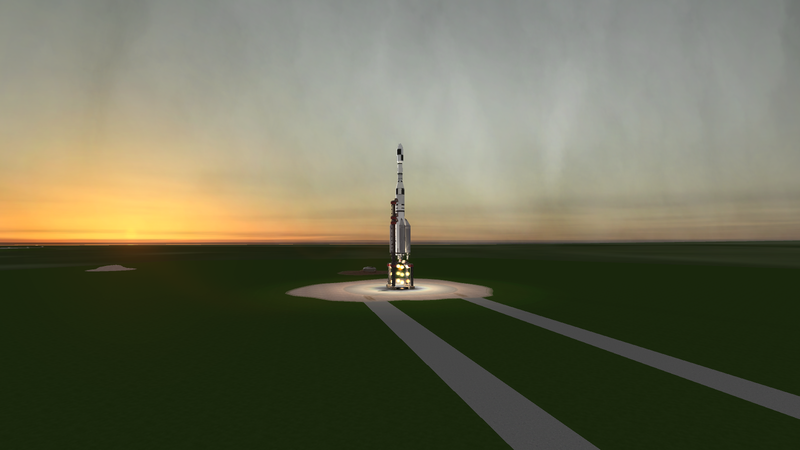 Crewing today is P0 Valentina Kerman. 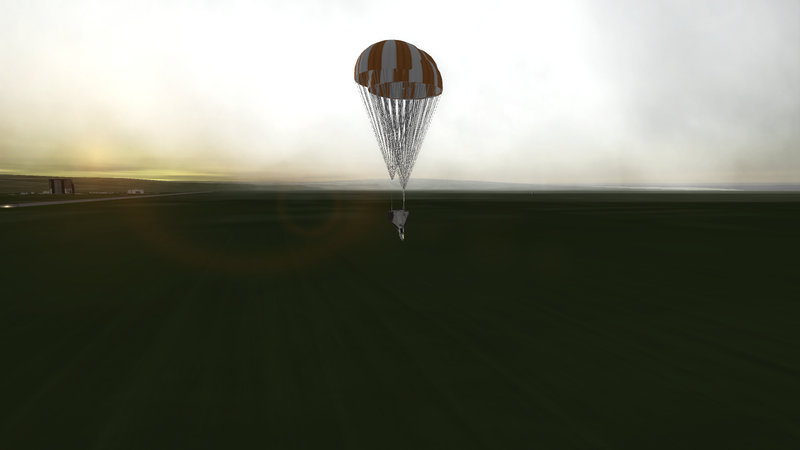 And a successful parachute landing in the sea. It would also appear that the tail unit has fallen apart. 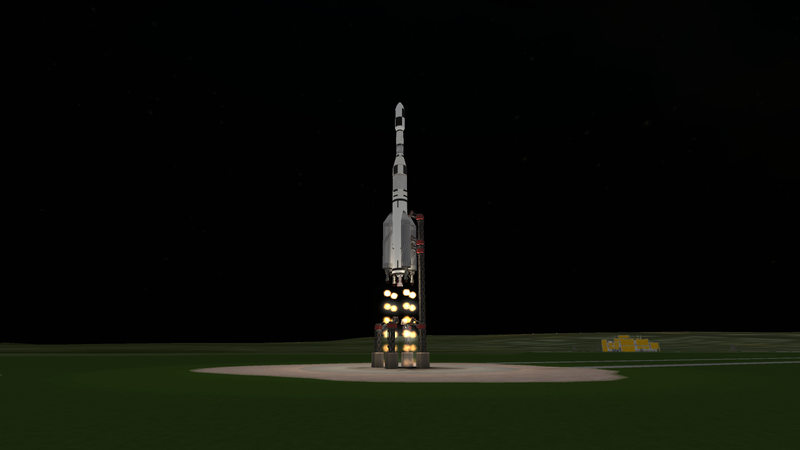 Mission: Try and make this [REDACTED] of a rocket work. 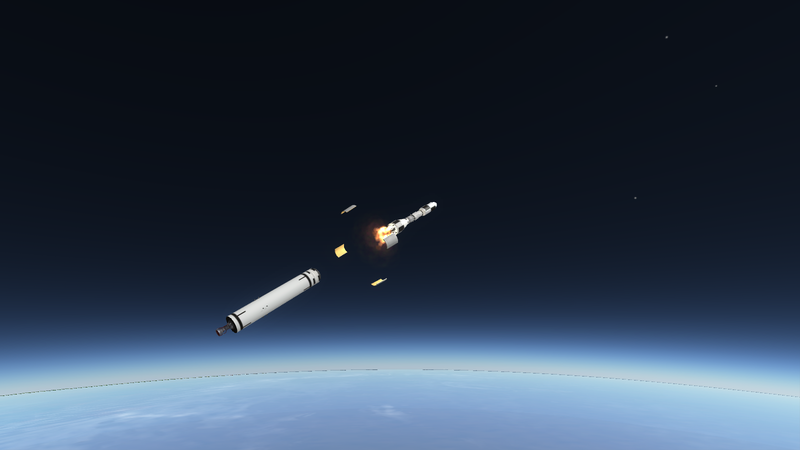 And so we're trying our nutty attempt at an orbital launcher again. And yes, it is the same day as the X - 2 broke the sound barrier. It's been a busy day. There's really not much to say about this mission. 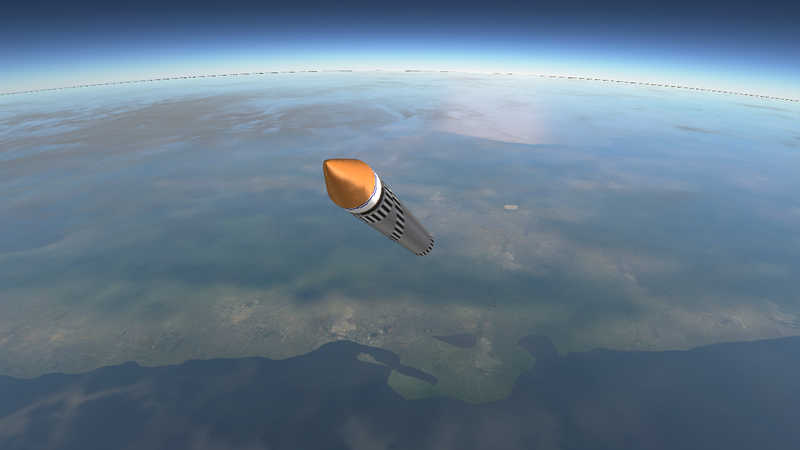 Then only real change is that we've added small fins to the second stage to try and stabilise it. It would appear that they worked. The stage didn't go into a spin, despite being left slightly off-axis by the stage separation. Aaand they're useless. An engine failed. I should have put money on it. Perhaps we should find some gruesome fate for the Aerobee's designer. Like designing a working version of it, perhaps. Mission: Prove to the USAF that we've come up with a practical design this time. 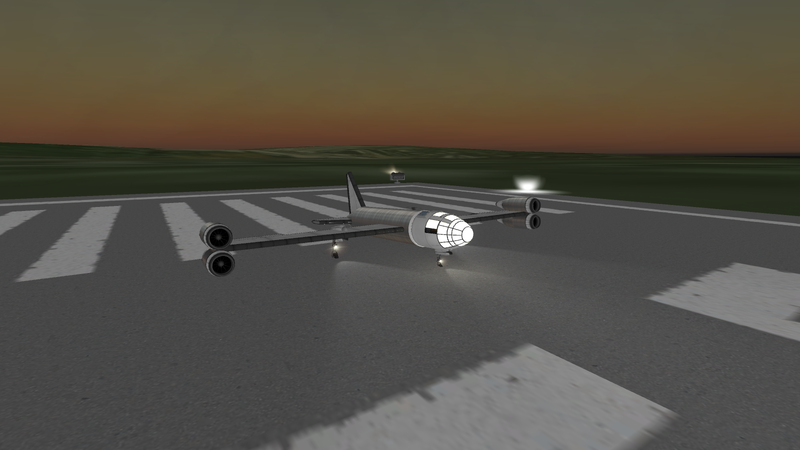 I think that I shall now introduce you to another of our inventions, the X - 1B. 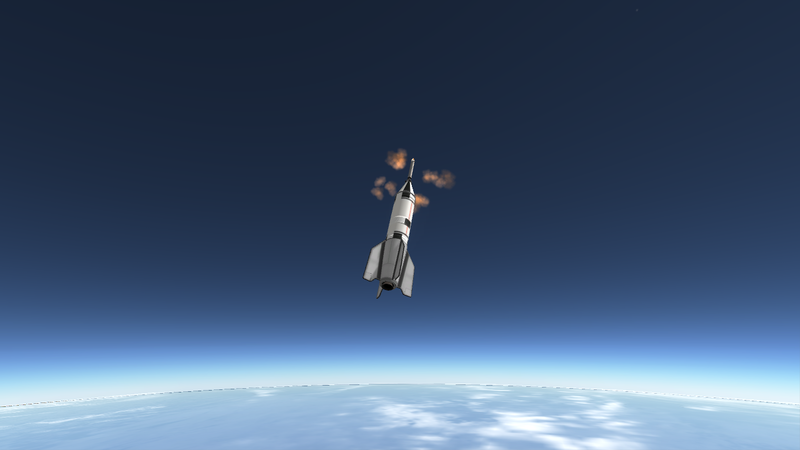 The original X - 1 was built to test out the theory that I can build and fly stuff in FAR. Then the USAF came up with a contract for a long-range reconnassiance/attack aircraft capable of cruising at 500+ mph at 40,000ft and loitering over a target for up to four hours at 5,000ft. 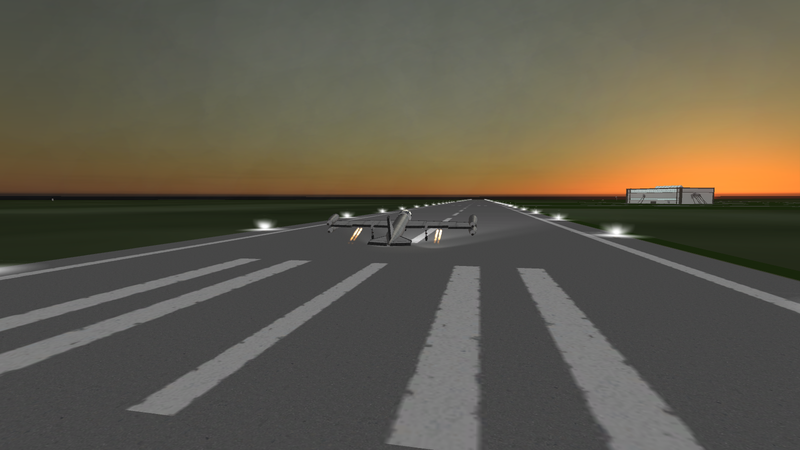 The contract specified that the aircraft needed the capability to take off and land on relatively short, rough airstrips to enable it to operate from forward bases, so we gave it RATO and drag 'chutes. To get the necessary performance, we basically turned the entire thing into a flying fuel tank (for endurance and range), gave it long, straight, glider-like wings (for the altitude performance) and slapped four new Rolls-Royce Derwent V jet engines on it for the 500+ mph speed. At about 15,000ft, it can reach and sustain 540mph without problems, so we're confidant it'll qualify for the contact. The only other firm to have made a bid for the contract is Lockheed, with their YU/A - 4, a huge, six-engined propeller machine. It failed to get the contract on the grounds that "a huge, noisy, six-engined propeller-driven machine will bring all the [REDACTED FOR CIVILITY] enemy fighters out of their holes for hundreds of miles around", and only one prototype was built. 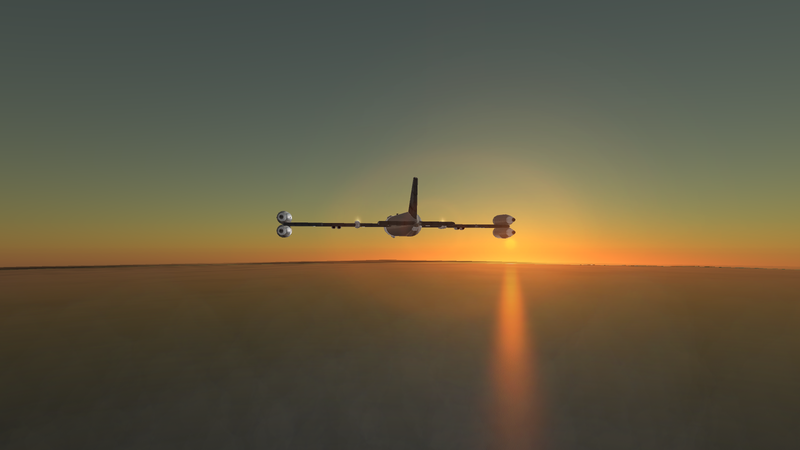 This flight has been to prove the effectiveness of our design. I think it also proved the prettiness of the sunset. 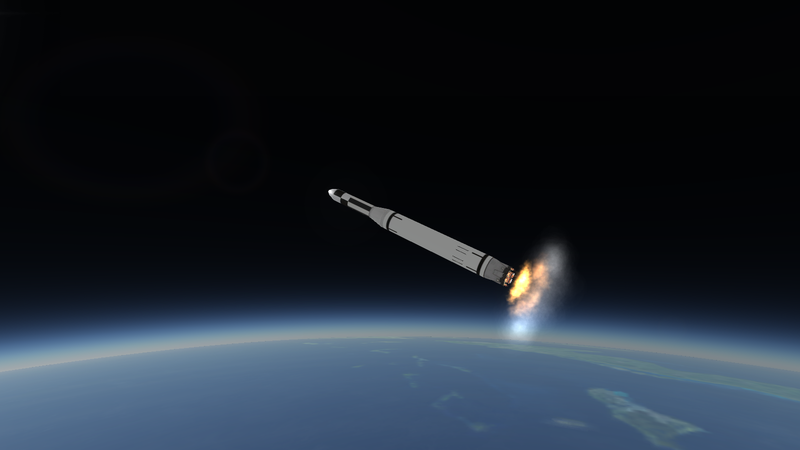 Mission: Prove that our novel way of getting Kerbals to Sub-Orbit isn't fatally flawed. 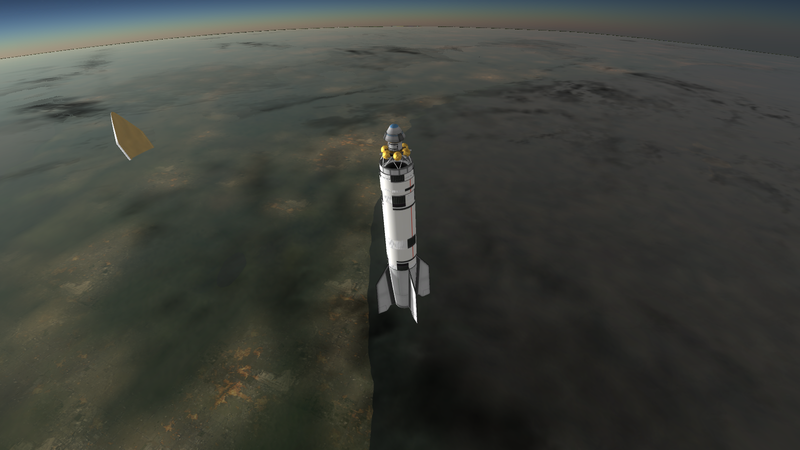 In a (probably ill-fated) attempt at putting Kerbals in space cheaply, the administration team has come up with the idea of a fully self-contained sub-orbital spaceplane. It has become this: the X - 3. 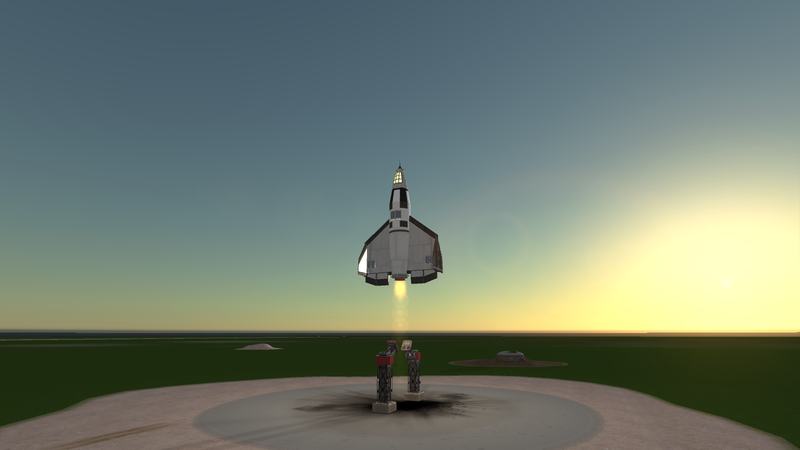 Built around the idea of an X - 2 cockpit strapped to an A4 lifter with wings, it's not particularly complicated. 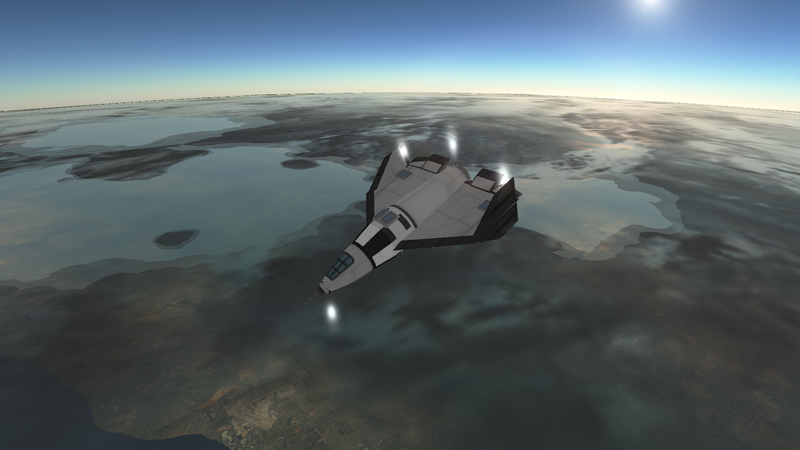 The vehicle uses the thrust-vectoring of the engine and the aerodynamic control surfaces in the lower atmosphere, and a brand new Nitrous Oxide RCS system at higher altitudes. Generally, it has less of a tendency to boil off and escape. 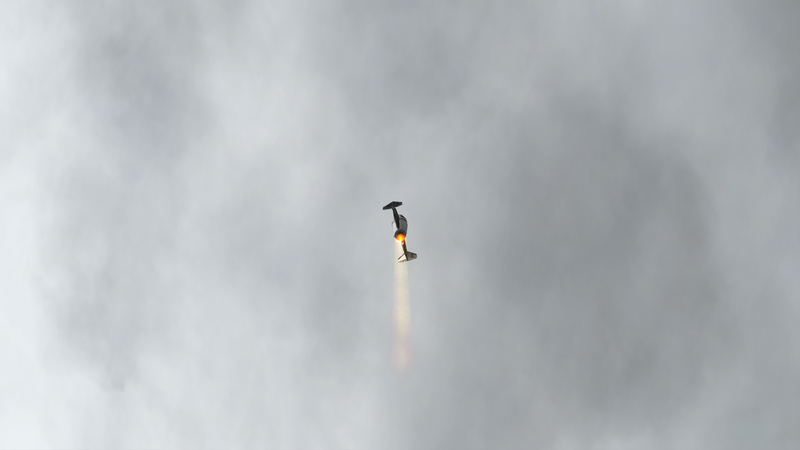 The Nitrous Oxide, not the spaceplane. 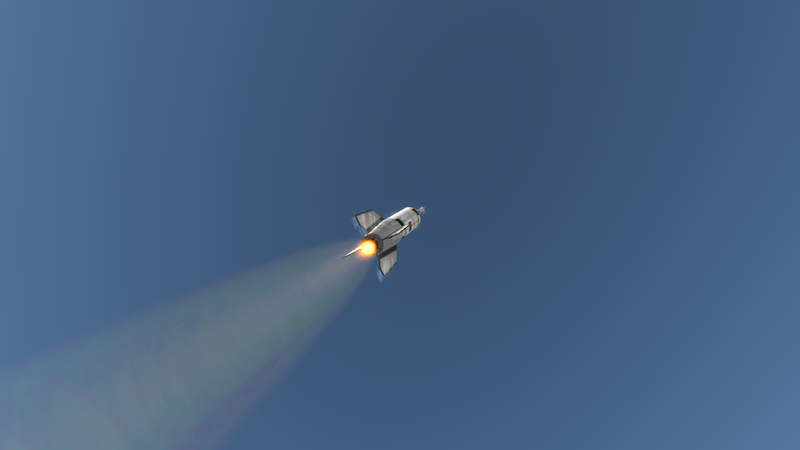 The X - 3 then re-orients itself for the descent, as it would do for a true re-entry. 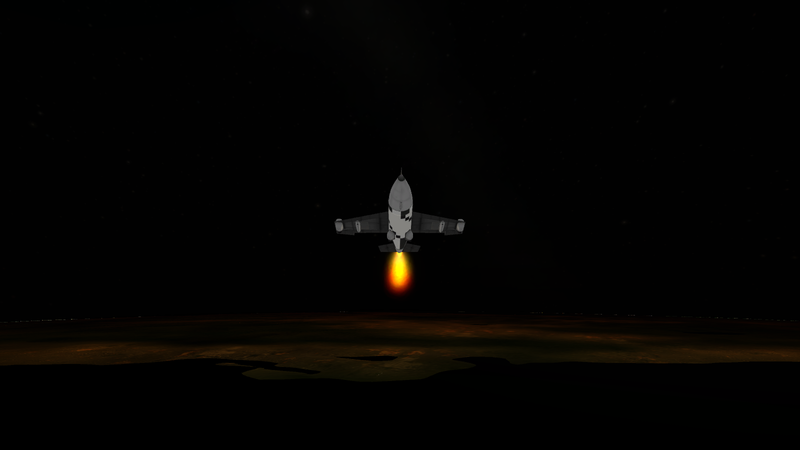 The decelleration isn't too intense from this altitude, but it'll be punishing on a full scale mission. 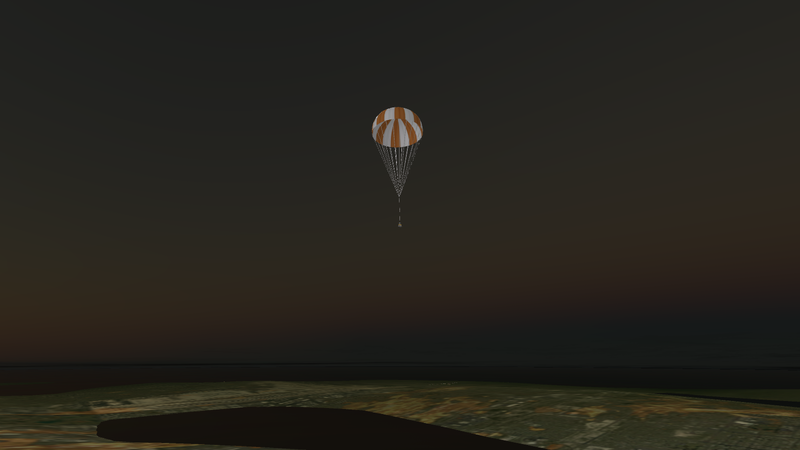 And the spaceplane parachute-lands within sight of the space centre. Right. Sorry I've been ignoring this for so long. Life happened. Anyway, let's get you lot somewhat caught up. 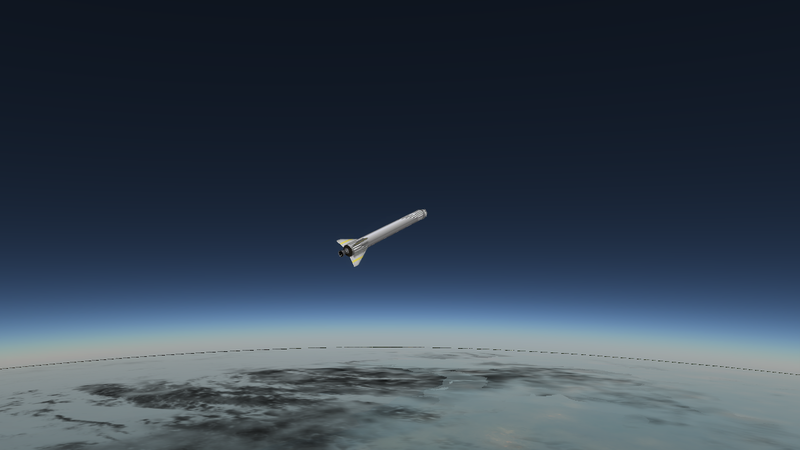 First things first, we re-designed our X - 3 into the X - 3A, capable of carrying a single Kerbal over the Karman line. 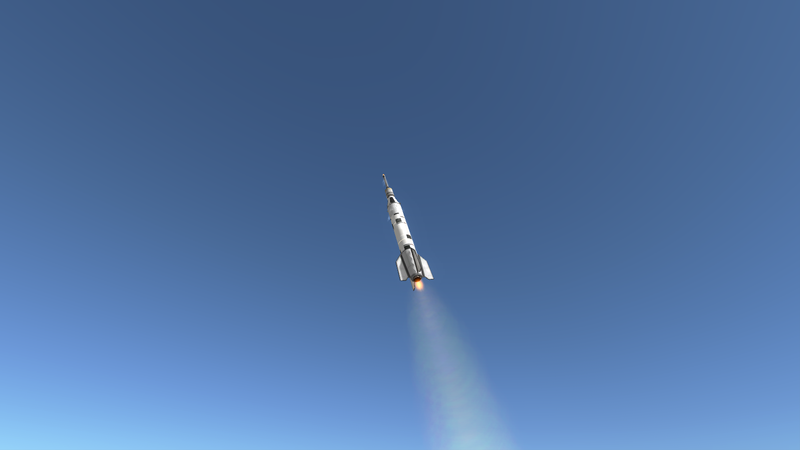 We made a single uncrewed test flight, an then started crewed flights, starting with a test mission that only flew up to 80km, piloted by P0 Jebediah Kerman. 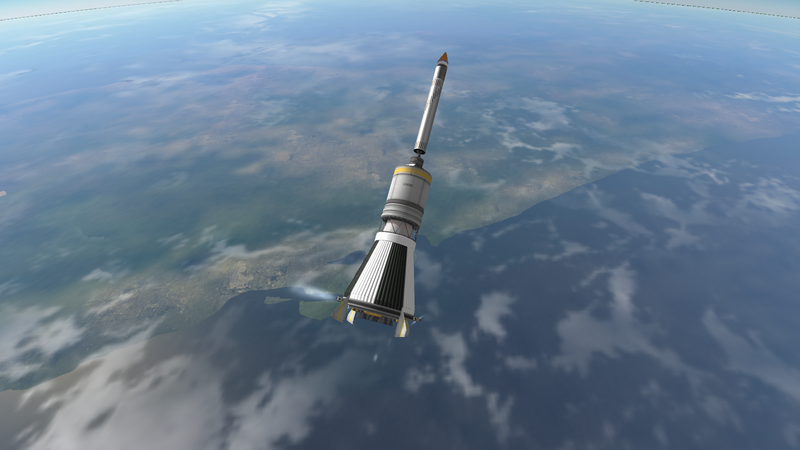 Then, on the 15th of March 1952, P0 Valentina Kerman became the first Kerbal in space on X - 3A Flight 2. 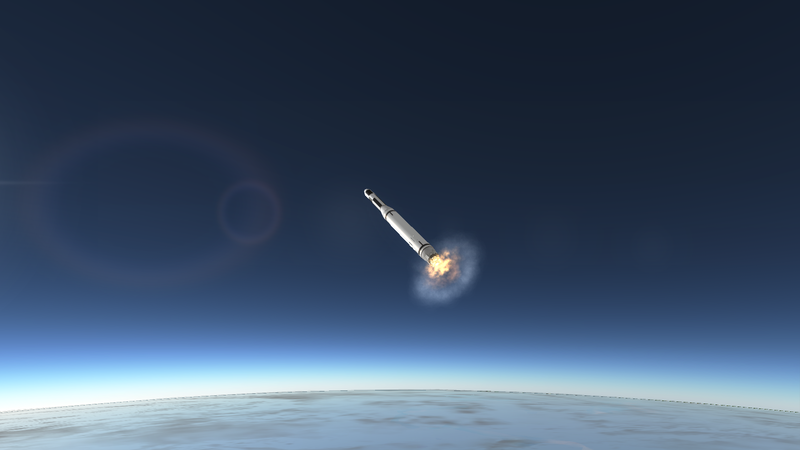 She was followed by P0 Jebediah Kerman, actually getting to space on Flight 3. We also continued the Devoid programme with this, Devoid - 3. 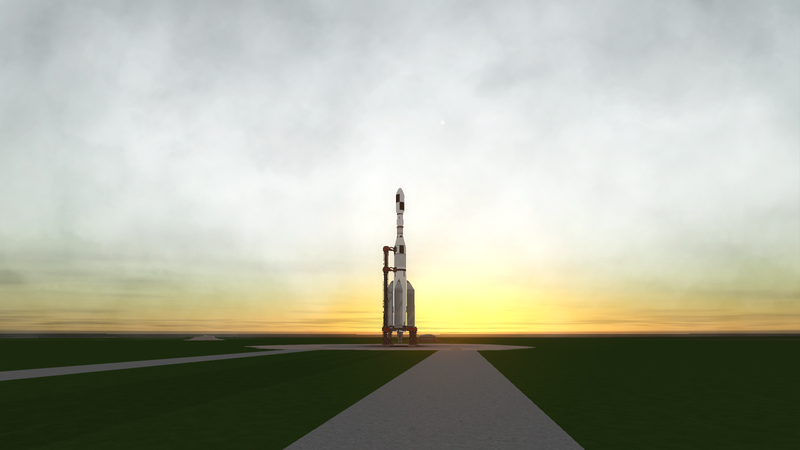 The major change from Devoid - 2 is the addition of a new upper stage, powered by the revolutionary new AJ-10 engine, making this an Aridia 4B lifter. Guess what? It failed miserably. We followed that dissapointment up with another attempt, this one with an improved Nitrous Oxide ullage system. While it also failed, I'd like to invite you to look at the little puff of reddish hypergolics in the center of the image. Yes, ladies and gentlemen, we got the AJ-10 to ignite (albeit briefly). After this, we've scrapping the Aridia 4B lifter and replacing it with something all-new: we call it the Devoid 1. 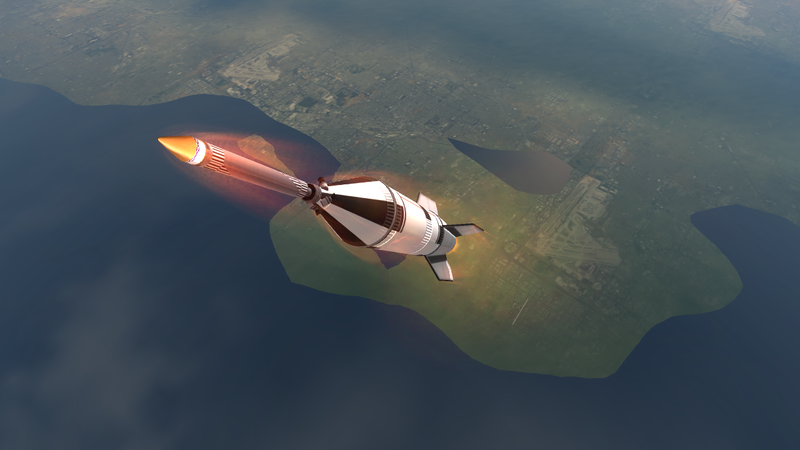 Mission: Try a new lifter out, and try to place a small satellite in orbit of Earth. 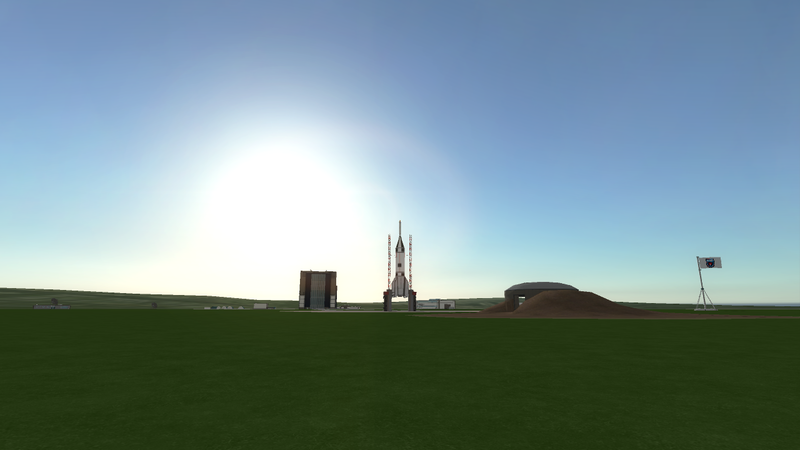 Launch Site: LC - 1, Cape Canaveral. 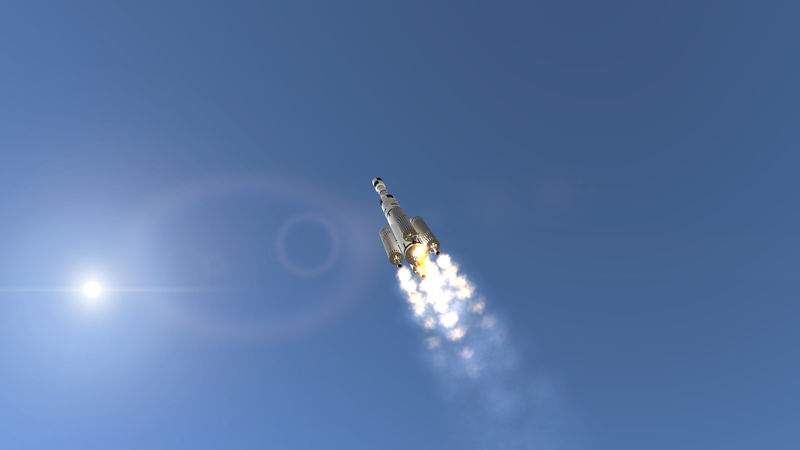 As promised, we're replacing our old Aridia 4 lifter family with something that can (theorectically, at least) reach orbit. Without further ado, I give you the Devoid 1 lifter. 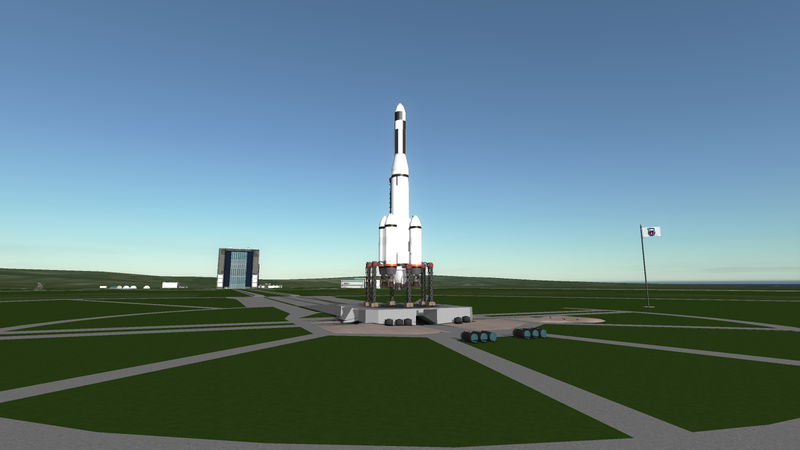 Powered by a single Ethanol75/Liquid Oxygen fuelled RD-103M and four XLR-50 kerolox booster engines, with a four-engined AJ-10 second stage, a single AJ-10 third stage and a solid-fuelled fourth stage, this new lifter can (theoretically) place 0.9 tons in Low Earth Orbit. 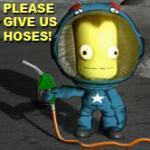 As long as it works, this will open up a new era of spaceflight. 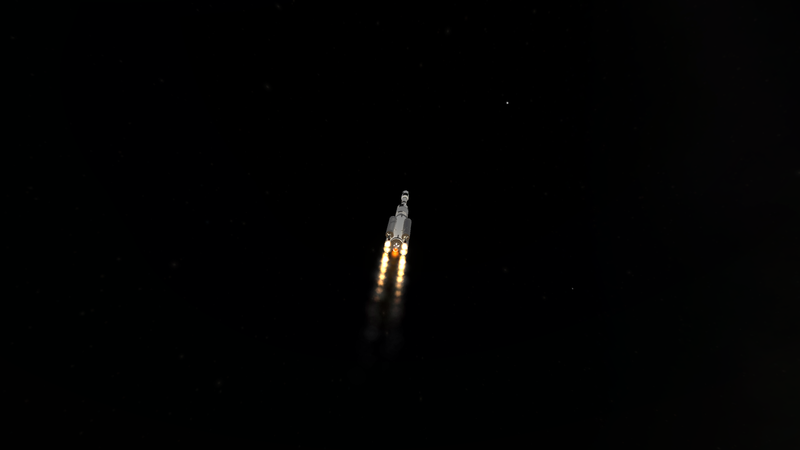 And we have booster separation, leaving the RD-103M core stage to fire on its own for a few seconds. 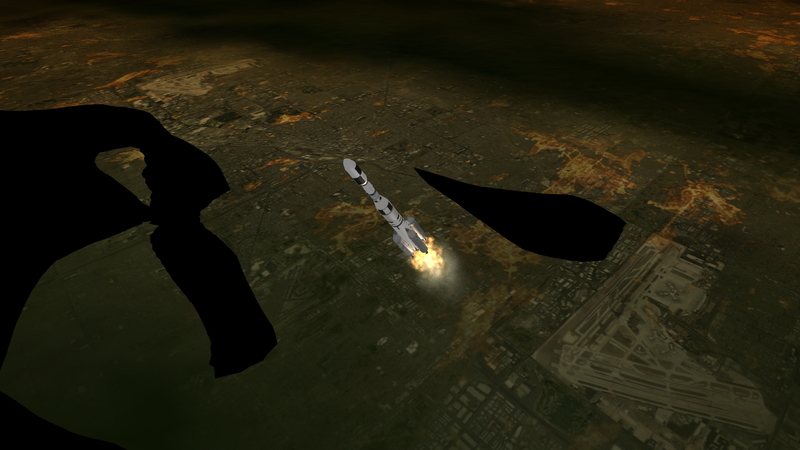 ... the second stage fails to ignite. Lovely. Ho-hum. 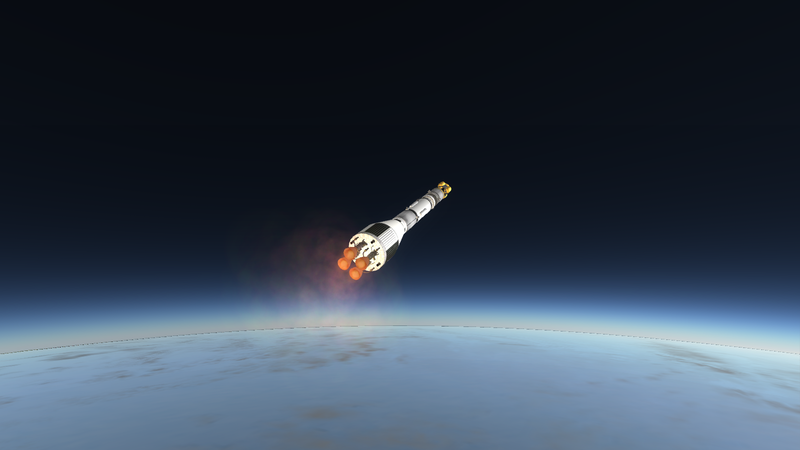 At least we can use this as a test of the third and fourth stages, even if it doesn't reach orbit. 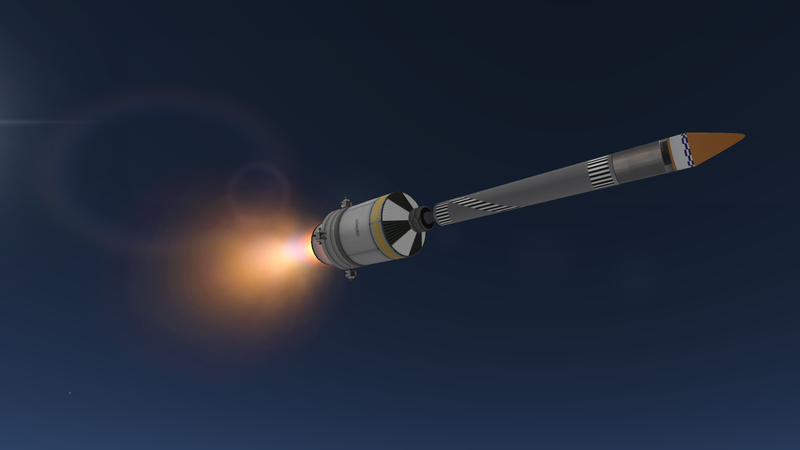 The third stage, unlike the second, worked absolutely fine, as did the solid-fuel fourth stage shown here. We then got down to testing the satellite's own Nitrous Oxide RCS system, and found it entirely satisfactory. 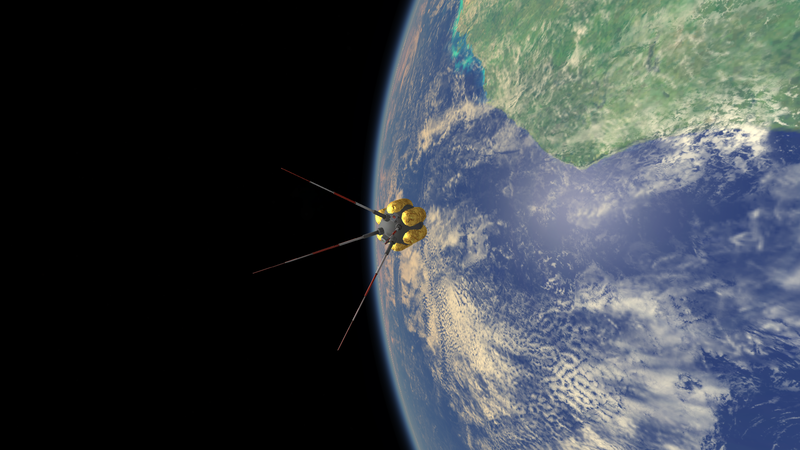 Mission: Try again to put a satellite into orbit around Earth. Well, here we go again. 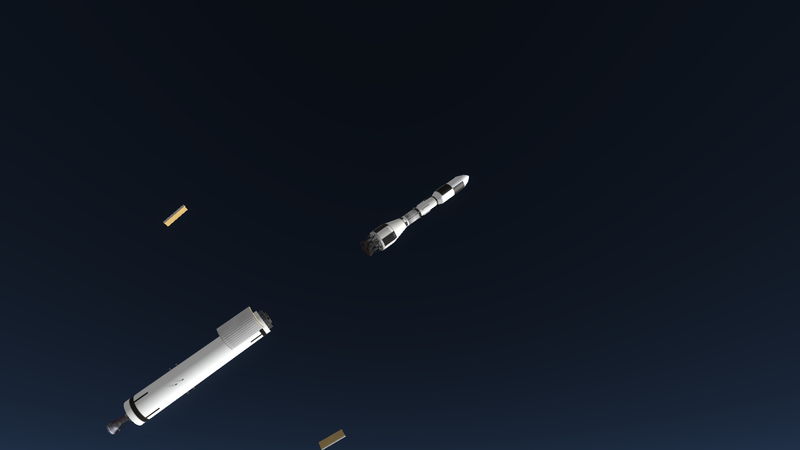 The lifter is almost identical to the one we used three months ago on Devoid - 5, except with four solid-fuelled ullage motors for the second stage to solve the problem we had last time. 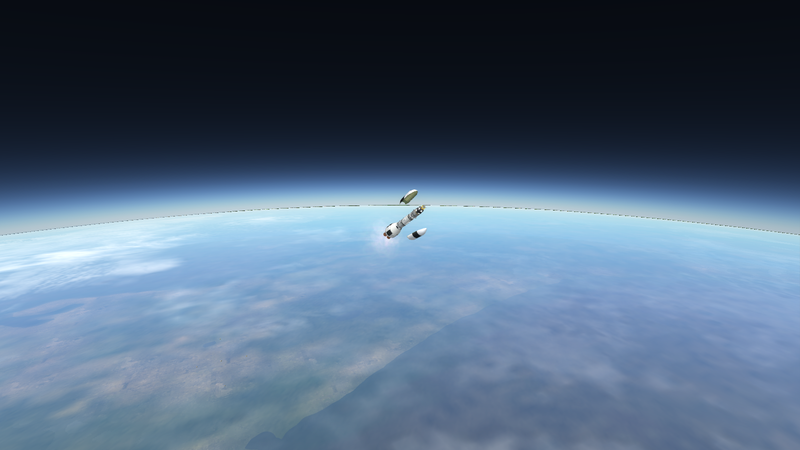 And there go the boosters. Interestingly, the core stage burns out less than ten seconds after this point. It's a very quick sequence of events. 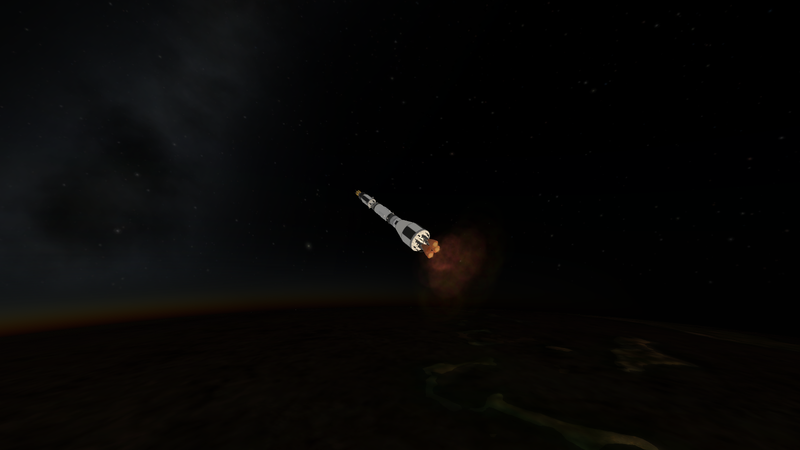 And the second stage ignites! At this point, half the control room breathed a sigh of relief that almost blew out the front windows. Just like last time, the third stage functions perfectly, and the mission continues toward orbit. 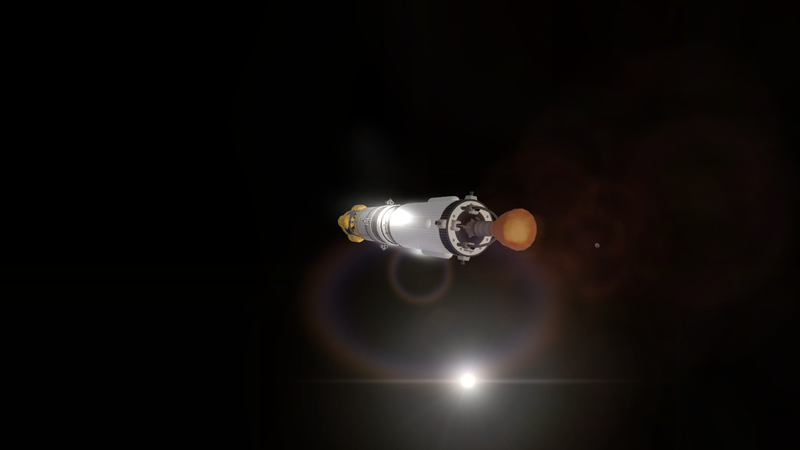 Then, the fourth stage goes to work. 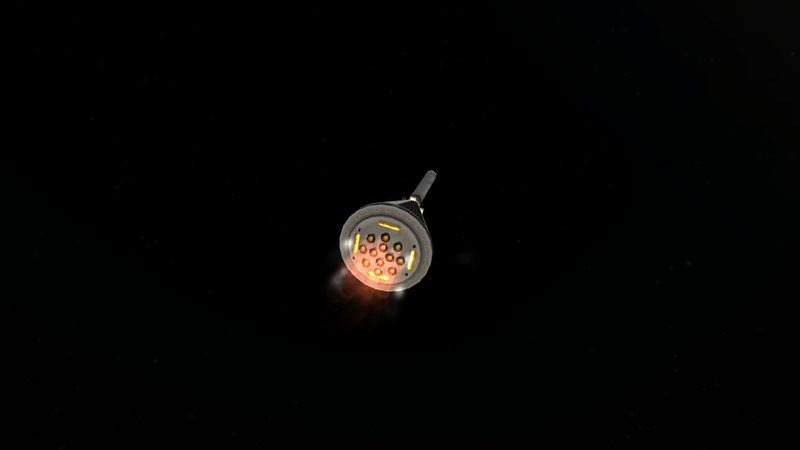 The little 'Star-37' motor has been reliable time and again, and this mission is no different. 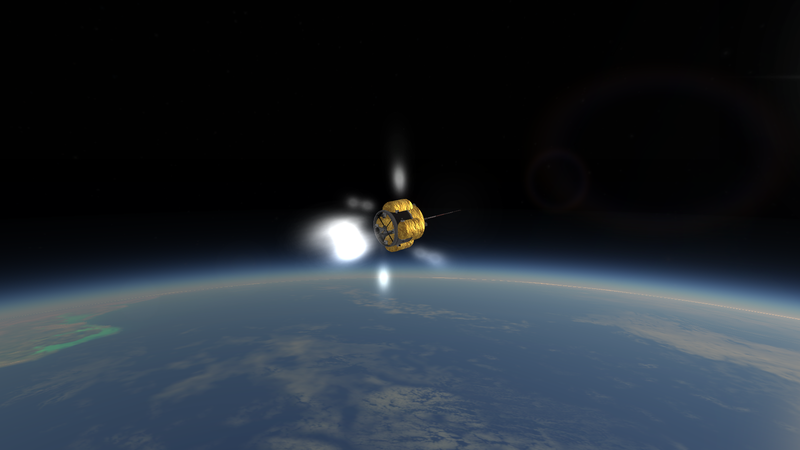 Then the little Aerobee engine propelling the satellite itself kicks in, making the final push into orbit. Right. Good job, everyone. Break out the champagne, let's get thoroughly hammered. OOC: By this point, it was 2AM, and I literally got up out of my chair and danced around the room. Mission: Prove that we weren't just insanely lucky with Devoid - 6. Just kidding. 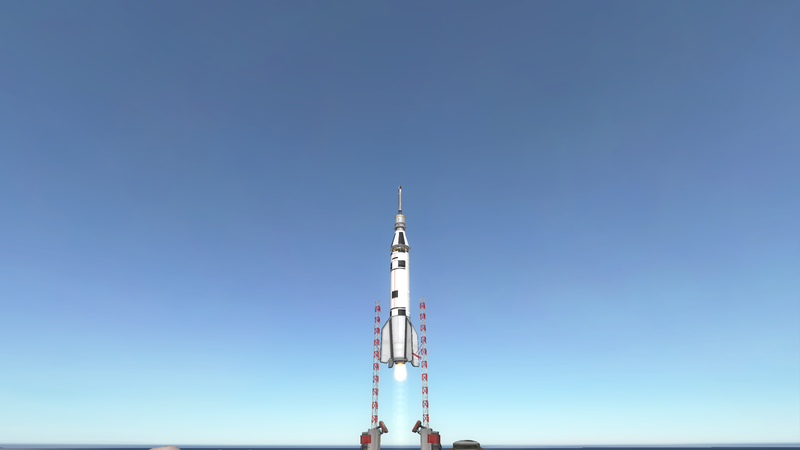 We haven't even changed the payload, let alone the lifter. This is an attempt to confirm that Devoid - 6 wasn't a fluke. This booster only has a 50% success rate, which doesn't really inspire confidence. 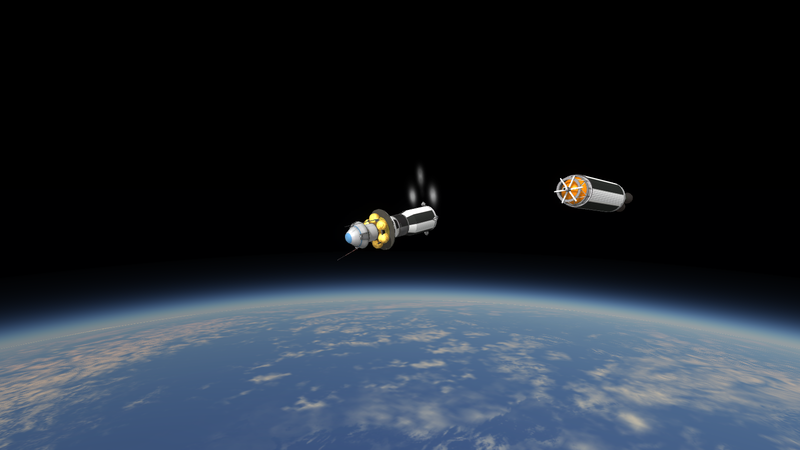 MECO, first stage sep and second stage ignition. 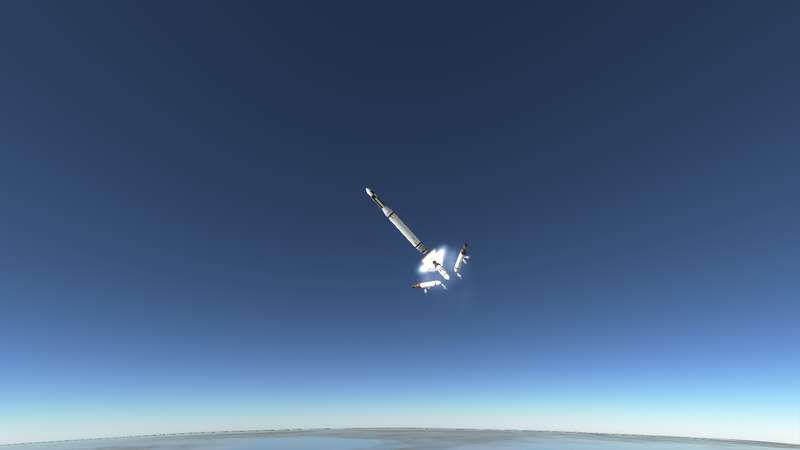 Test Flight strikes again. At about this point, the AJ-10 started losing thrust output. 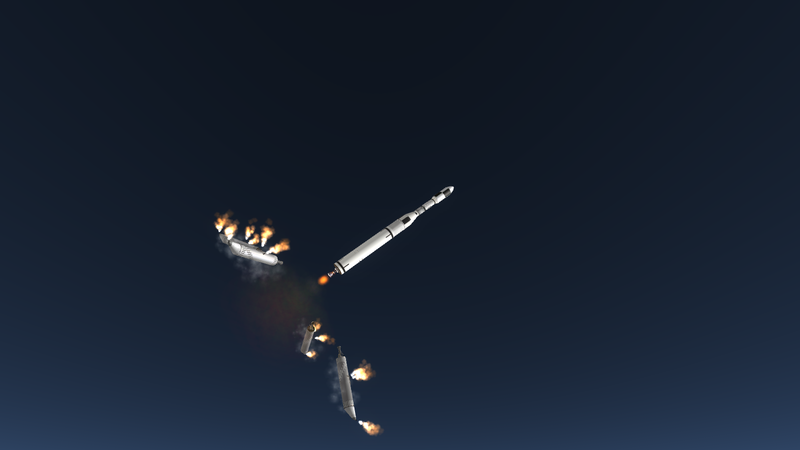 It then promptly totally failed and, in our infinite optimism, we ignited the fourth stage in an attempt to reach orbit. Ah, yes. The familiar, bitter taste of failure. What's doing that? BARIS or some other species of gremlin? BARIS or some other species of gremlin? What on Earth is BARIS? Ah. No. 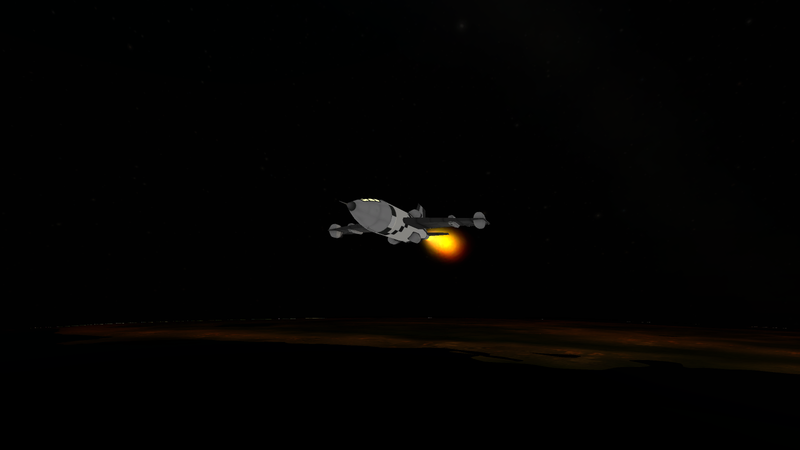 It's Test Flight. Same function, different mod. Makes engines more reliable the more you time you fly them. 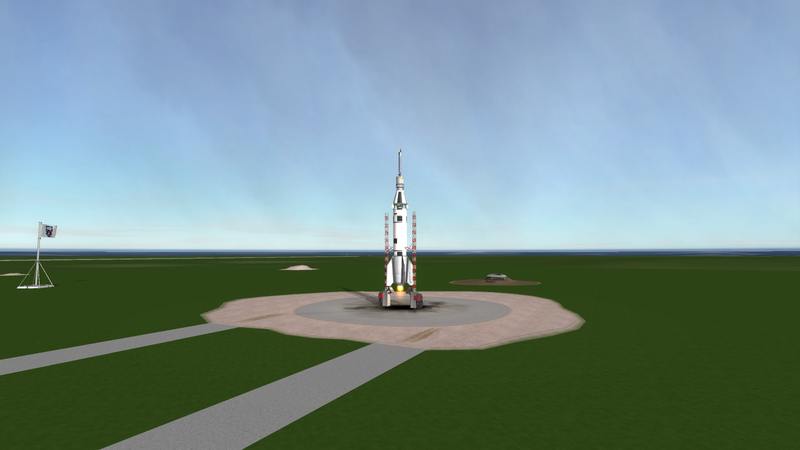 Encourages you to make dedicated test flights, use test stands etc. 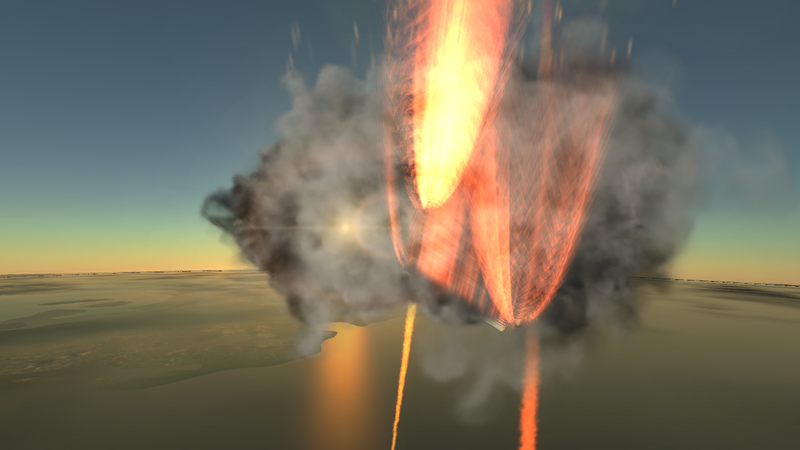 And so another vehicle succumbs to the vagaries of Test Flight. 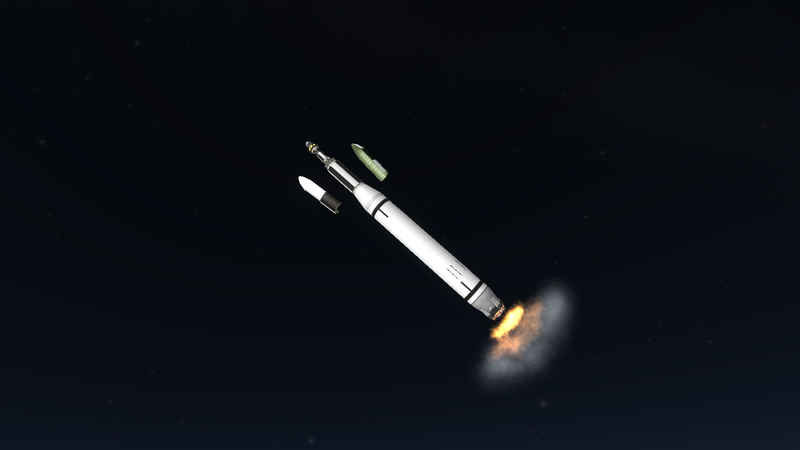 If it makes you feel any better you're about on par for the success rate of the Vanguard booster. If it makes you feel any better you're about on par for the success rate of the Vanguard booster. Remarkably, it does make me feel better. If the United States of America couldn't do better, then I'm fairly happy. EDIT - I love that my failure has 66% more likes than my success. 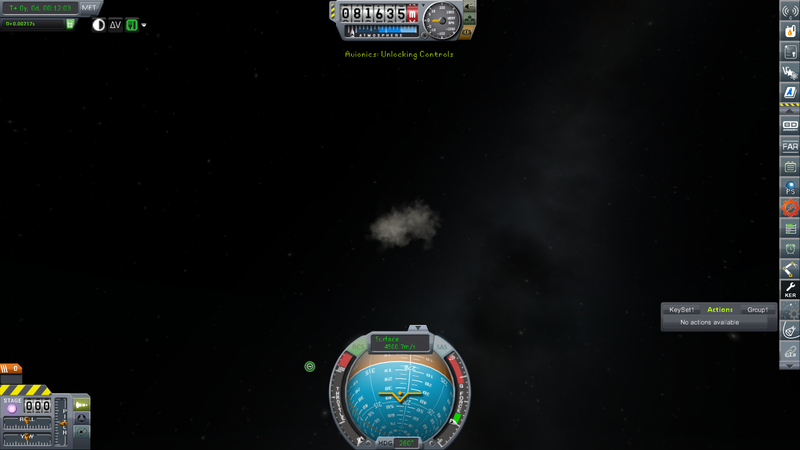 If that doesn't sum up KSP, then I don't know what does. Righty-ho. 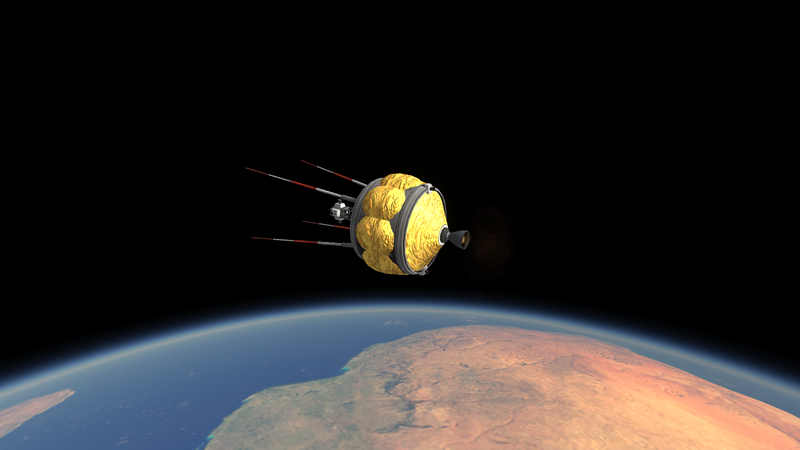 We've decided to take a new approach to this whole 'flinging rubbish into space' business. 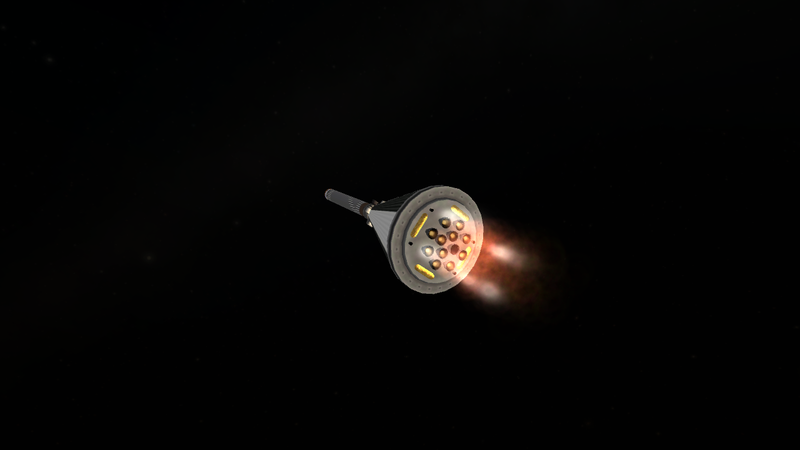 Instead of big, self-propelled 1 ton satellites, we're going with a little 114kg probe without even a Reaction Control System, let alone an engine. 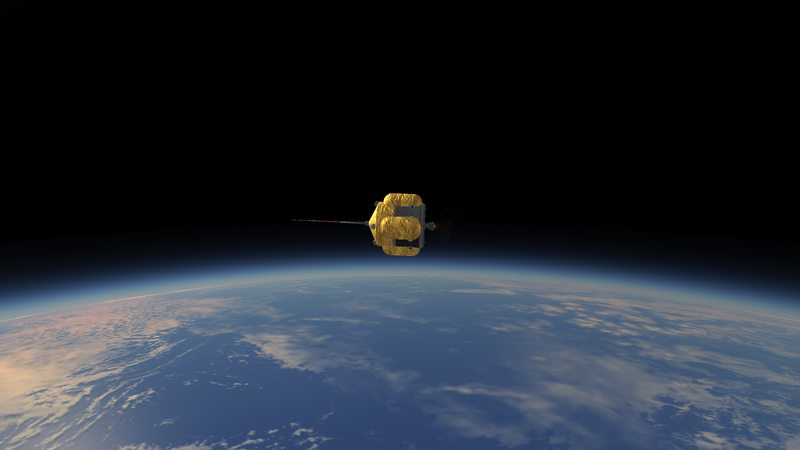 Hopefully, this will enable the Devoid - 1 to launch the little probe into a far more eccentric orbit than we've ever managed. Also, I'm in a bit of a hurry tonight, so don't expect much commentary or wit. The launcher is totally standard. No particular changes, except to the Nitrous Oxide tankage on the fourth stage. 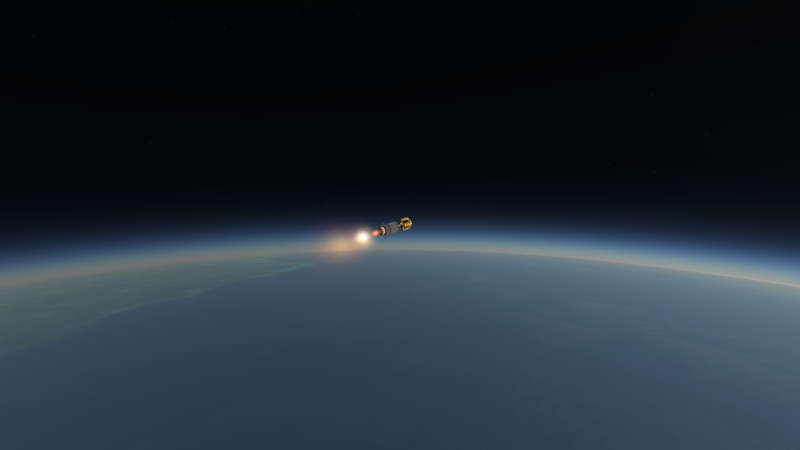 First stage separation and second stage ignition. 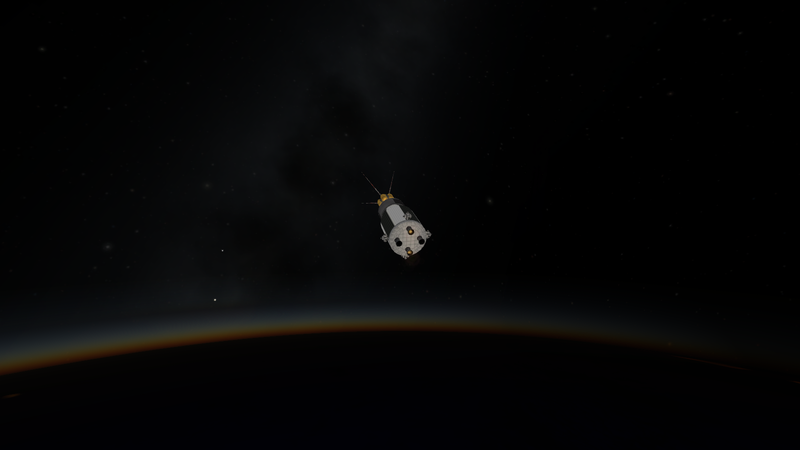 And there it is, our new Devoid-B type satellite. Totally battery powered, like the Devoid-A type, but lacking the heavy propulsion systems. 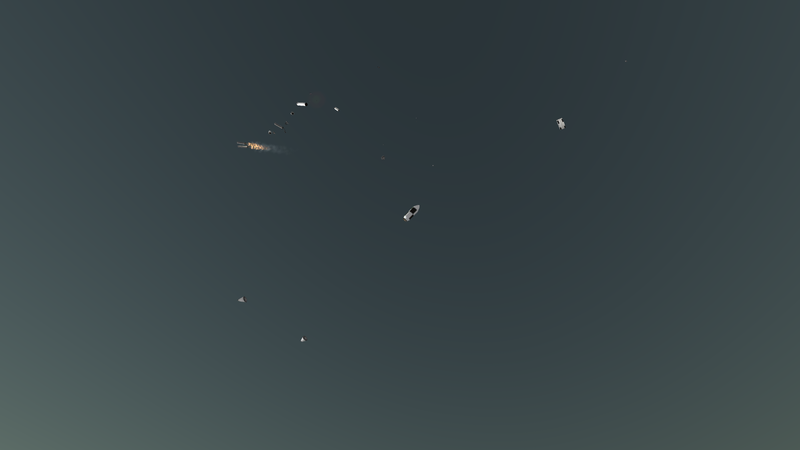 After the third stage separated, the spacecraft and the Star-37 SRM coasted for about a minute and a half until they were closer to apogee, then the Star-37 ignited, propelling Devoid - 8 into a higher orbit than we've ever achieved. Look at us go, everyone! 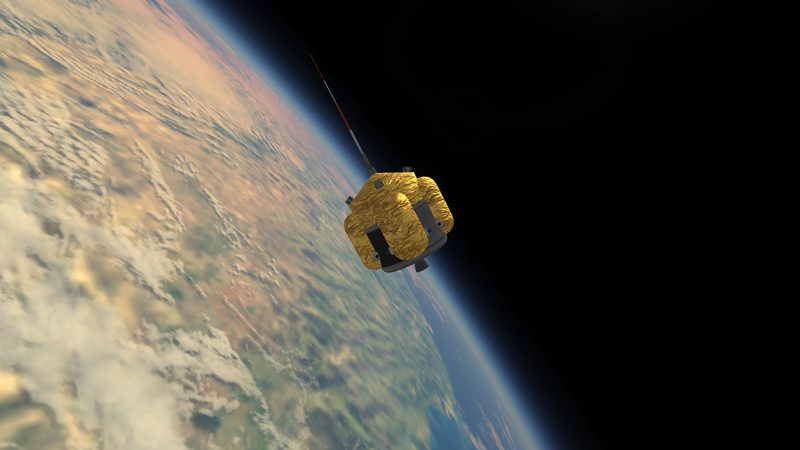 Mission: Launch the first ever commercial satellite. 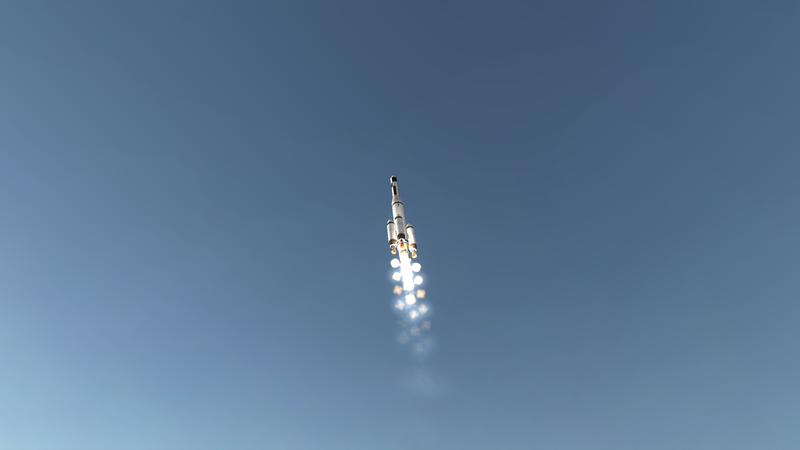 After our success on Devoid - 8 proved that the success of Devoid - 6 wasn't a coincidence, we've started recieving contracts for commercial launches! 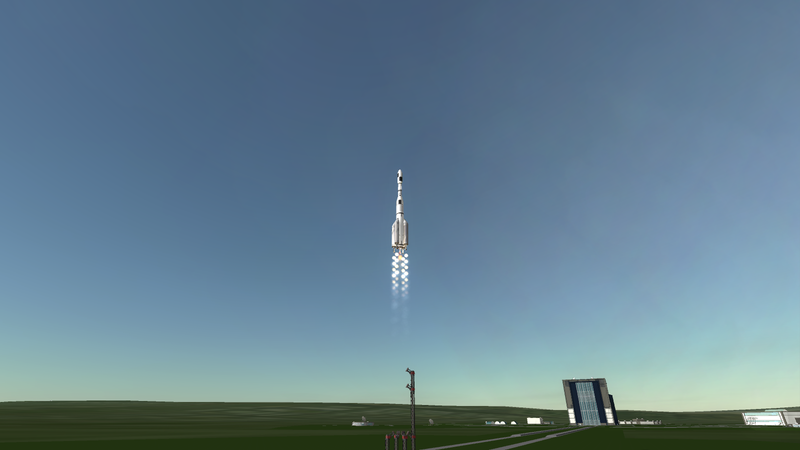 We're using a new adaptation of the Devoid 1 Launch Vehicle, the Devoid 1A. The primary difference is the fourth stage. 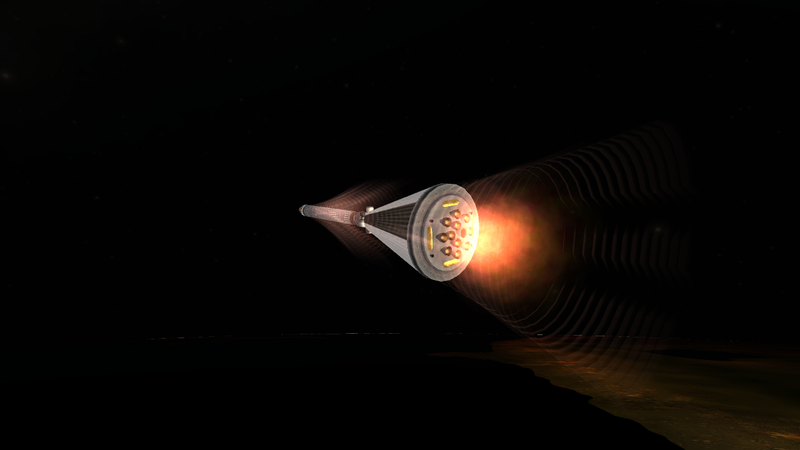 It's our first re-ignitable upper stage, designed to place a satellite in a specific orbit. It's built of two pairs of XASR-1 hypergolic engines, each with one ignition, to be fired in pairs. The XASR-1 is a development of the Aerobee, FYI. 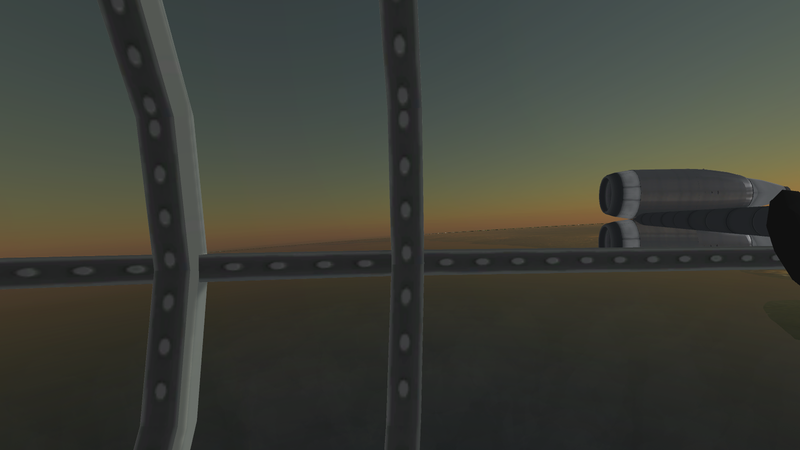 But then, less than a minute into the flight, something goes wrong. 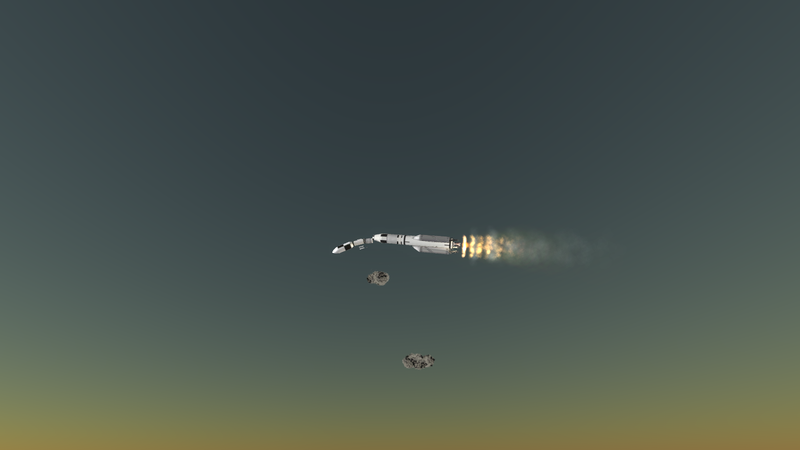 One of our XLR-50 booster engines has failed. 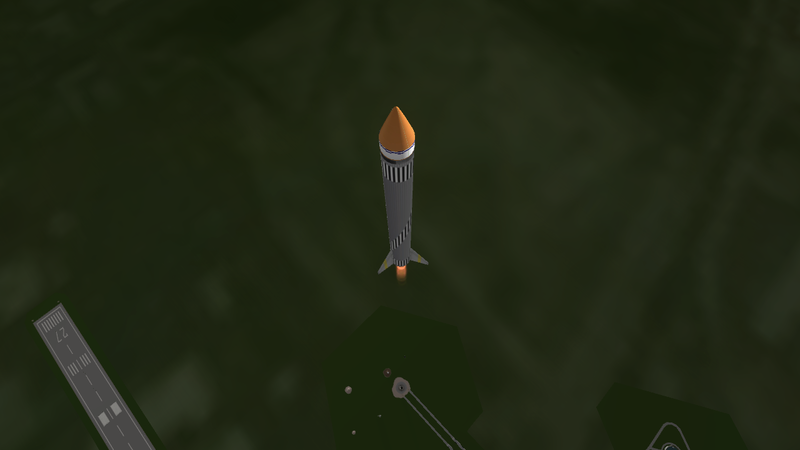 Mission control decide to jettison the booster, and manage to regain some control of the rocket. Perhaps we will go to space today after all. Or maybe not. After another couple of kilometers, we lost control of the vehicle, which promptly disintegrated. Well, back to the drawing board. 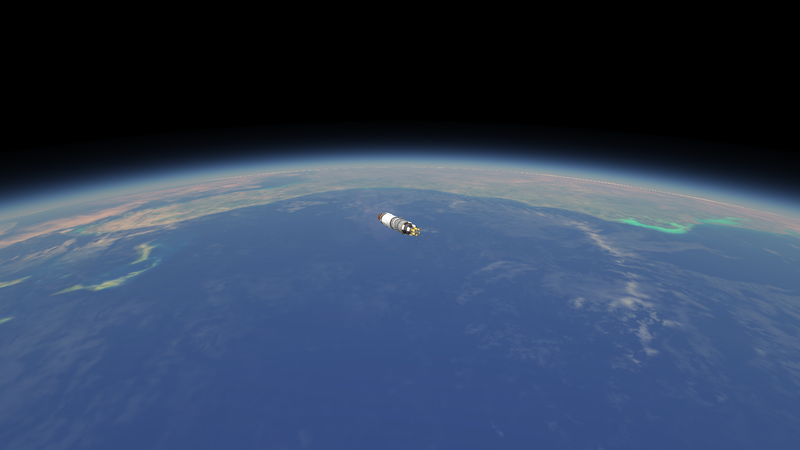 Mission: Place a payload in orbit, and then return. 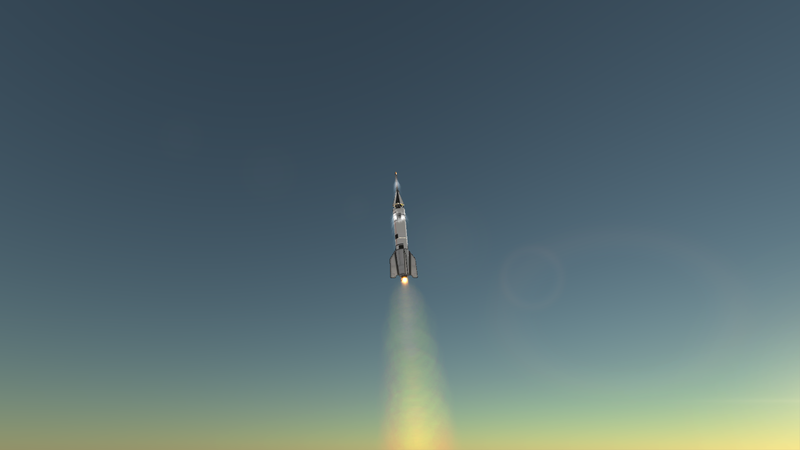 Although it hasn't been officially announced yet, the KSA is beginning to look toward crewed orbital spaceflight, and one of the vital parts of that it being able to get the crew home afterwards. 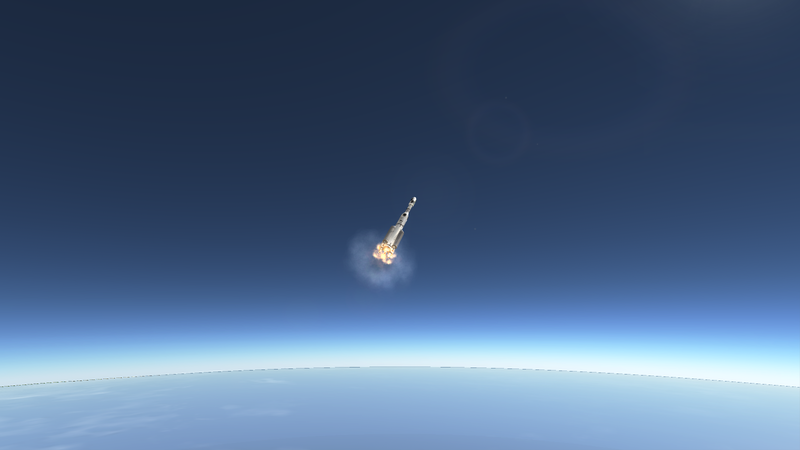 In order to do that, we've decided to make an all-up orbital return mission. A lot of new ground is going to be broken here, and a lot of records set. For one, this is going to be the largest object ever placed in orbit, weighing over two tons. 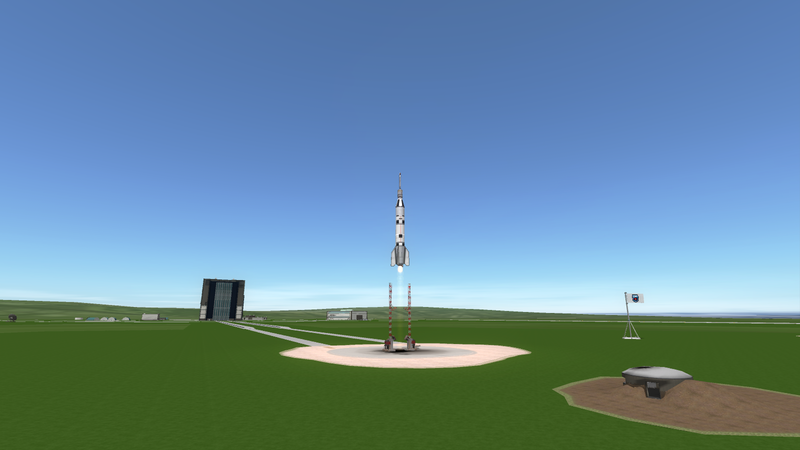 To fire something that large into orbit, it's clear we'll need a huge lifter, so we've come up with this; the Domain 1. 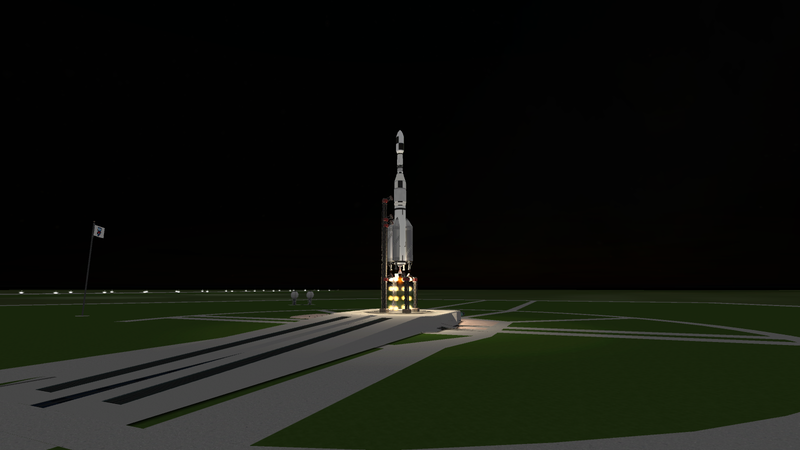 Tipping the scales at 240 tons on the launch pad, it is by far the biggest rocket ever built. It consists of three stages. The first stage uses a huge new engine called the RD-108 for its core, assisted by LR-79 booster engines, all together putting out over 3.7 mN of thrust at peak. 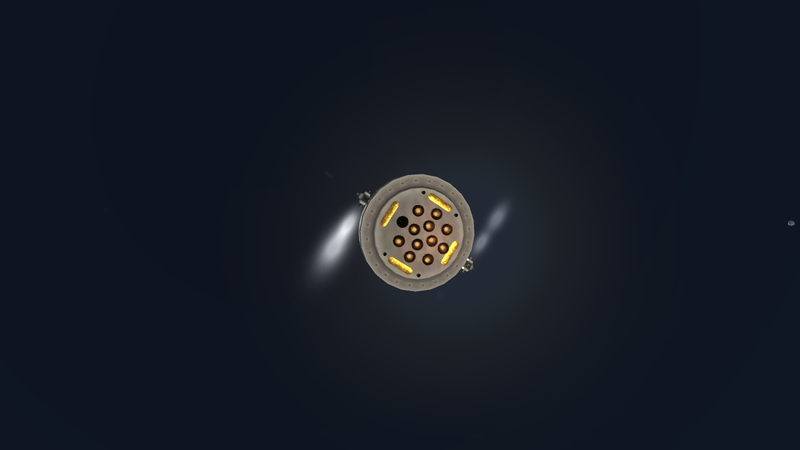 The second stage is built of four AJ-10 hypergolic engines, like the second stage of the Devoid 1, and the third stage is our new two ignition XASR-1 stage. The launch vehicle thunders off the new pad at Launch Complex - 3 with more noise than we've ever experienced here at the Cape. Unusually, for a first flight, everything is going suspiciously well. 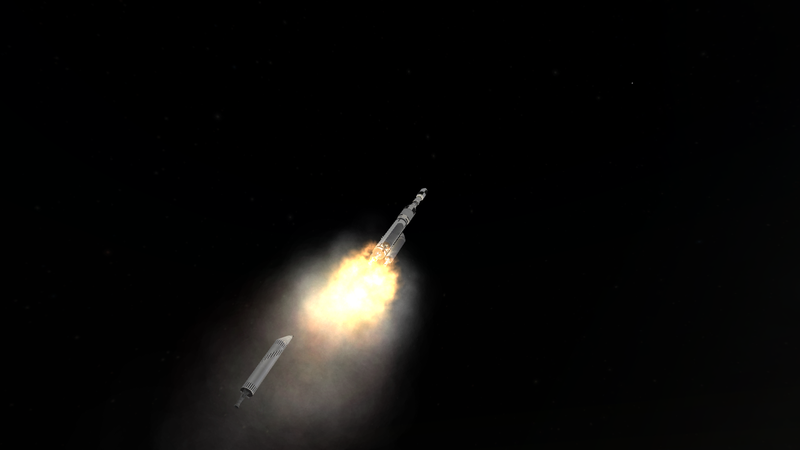 The LR-79s separate, leaving the RD-108 sustainer to haul the rocket out of the atmosphere. 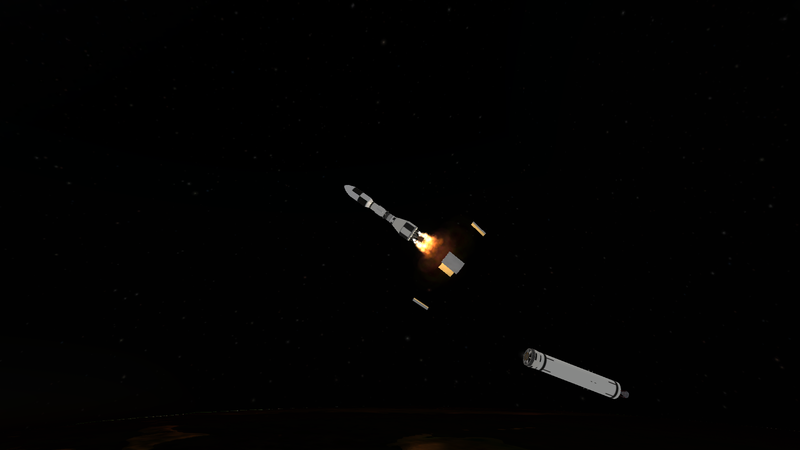 MECO, first stage separation and second stage ignition. And now we get a decent look at the spacecraft. 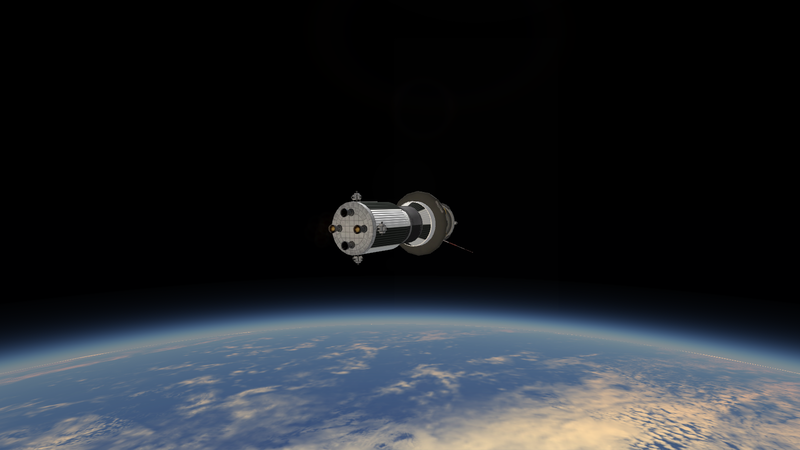 In this instance, the third stage also serves as the Propulsion Module for the probe. 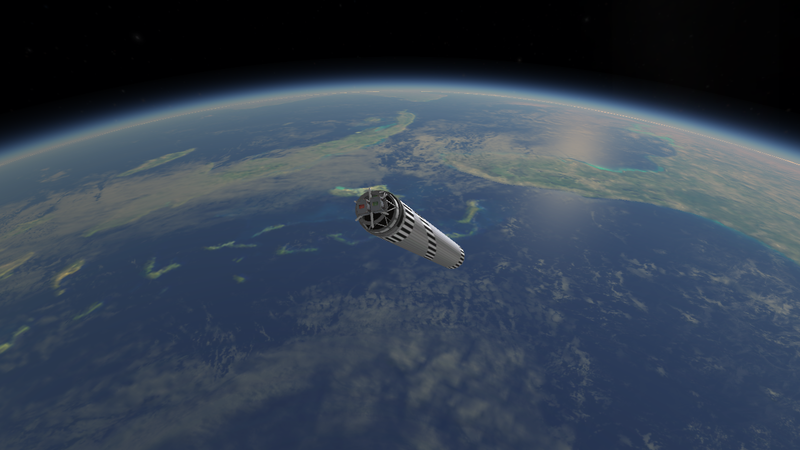 SECO and second stage separation. The spacecraft will now coast for about three minutes until it reaches apogee. 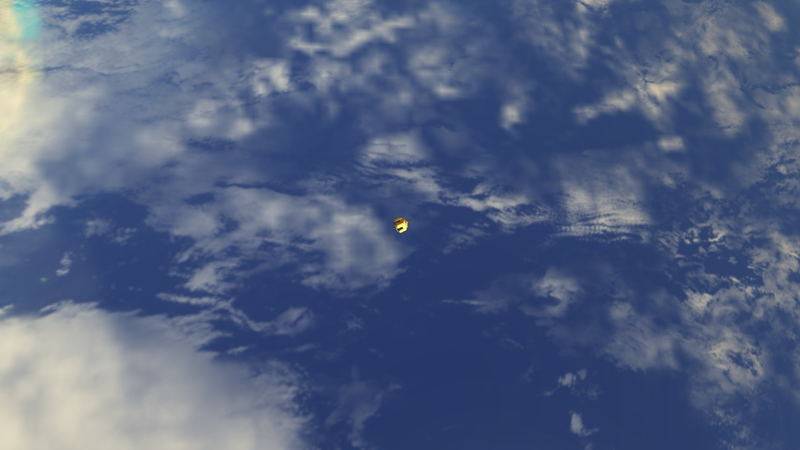 Now at apogee, the XASR-1s light up to place the spacecraft in Low Earth Orbit. The biological sample (a bat, for some strange reason) is studied, and it is concluded that bats lose their minds in microgravity. I think we should get that little fella home. He looks quite distressed. I doubt he's enjoying that, either. Let's just hope the heatshield holds up. 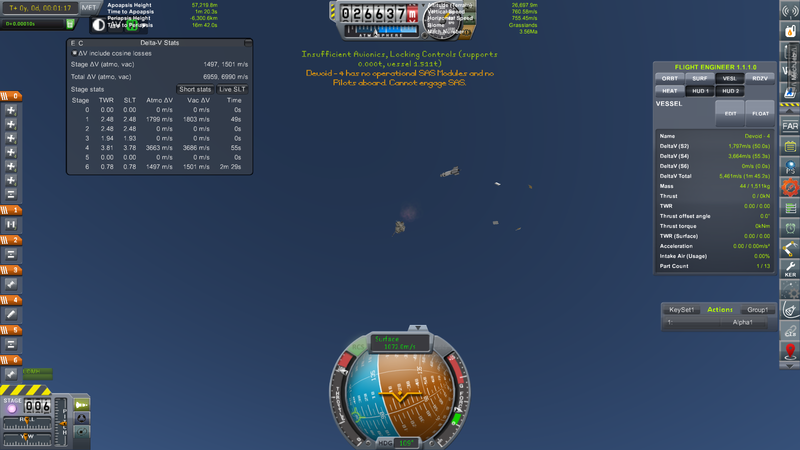 After several minutes of sustained decelleration, our intrepid little spacebat has returned from orbit, parachute-landing in the Pacific Ocean and being recovered by the US Navy. The bat was recovered in a healthy, if somewhat grumpy state, and netted us 10 science points. 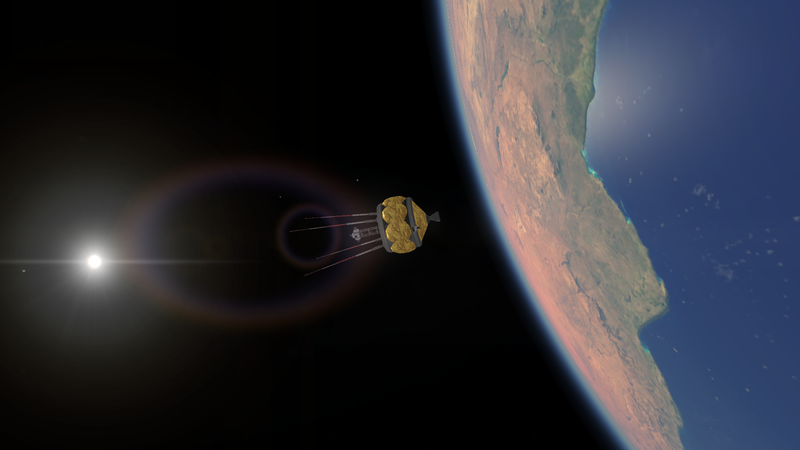 Mission: Test out our new Lunar probe in Low Earth Orbit. Alright then. 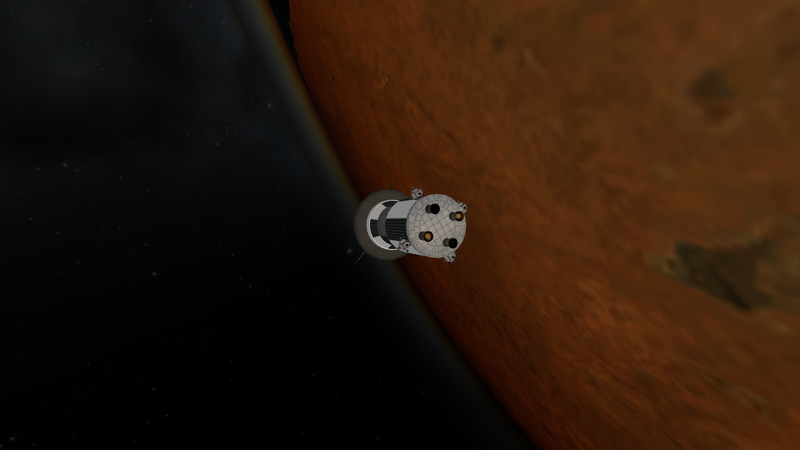 We've managed to place things in orbit, and bring something back from orbit. The administrative team have decided that the logical next step was our very own natural satellite: the Moon. 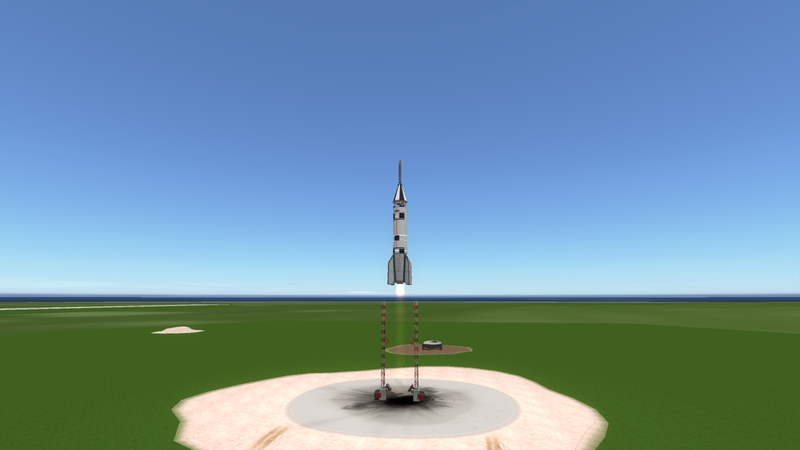 For that purpose, we're starting a new programme: the Genesis Lunar Exploration programme (Genesis programme for simplicity), which will start with Lunar fly-by probes, then impactors, then orbiters, and finally, landers. After that? No idea. We'll burn that bridge when we come to it. But today is a test run. 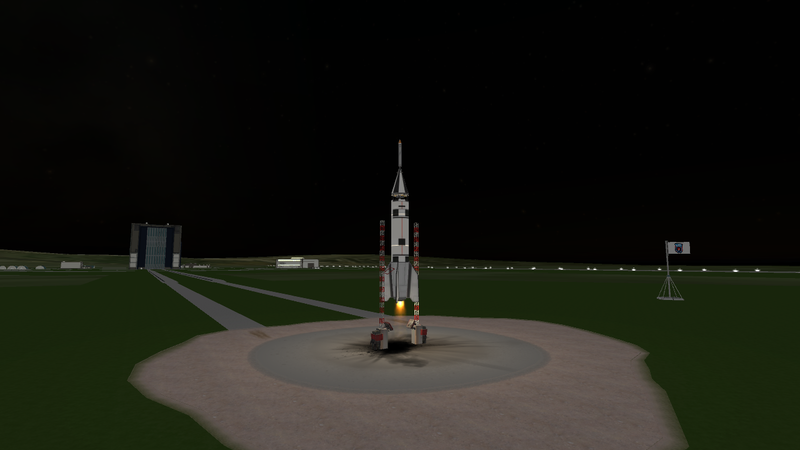 We've got a booster to put 2 tons into LEO, so we're going to test the Genesis Type A spacecraft, which we'll be using for the fly-by missions. 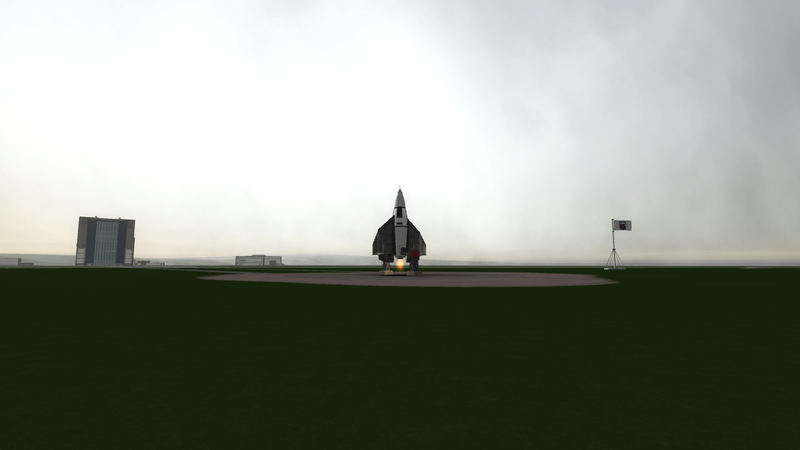 Due to our frankly awful hardware, it's easier for us to actually fly the mission instead of trying to simulate it. 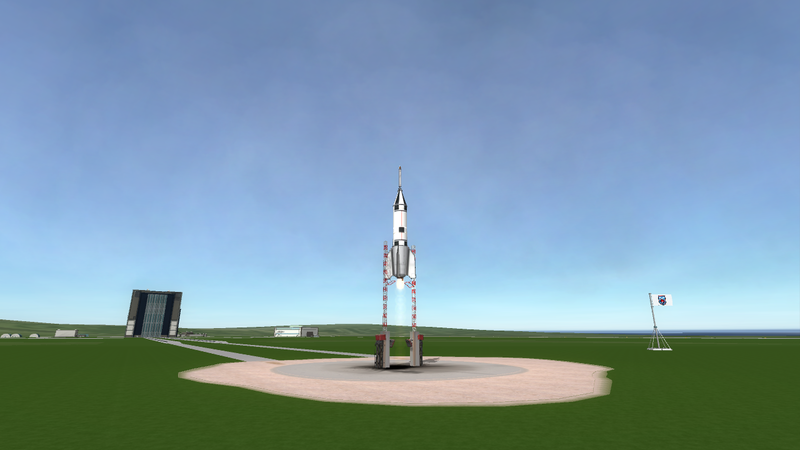 The booster is pretty much an identical configuration to the Domain 1's first flight, with just minor changes to the third stage. 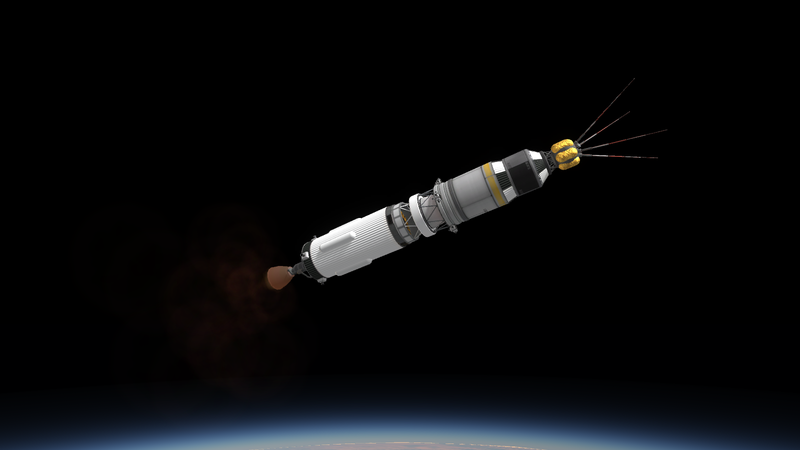 The mission will be, simply, place the probe in orbit and fully test-fire the brand new Hydrazine Reaction Control System. 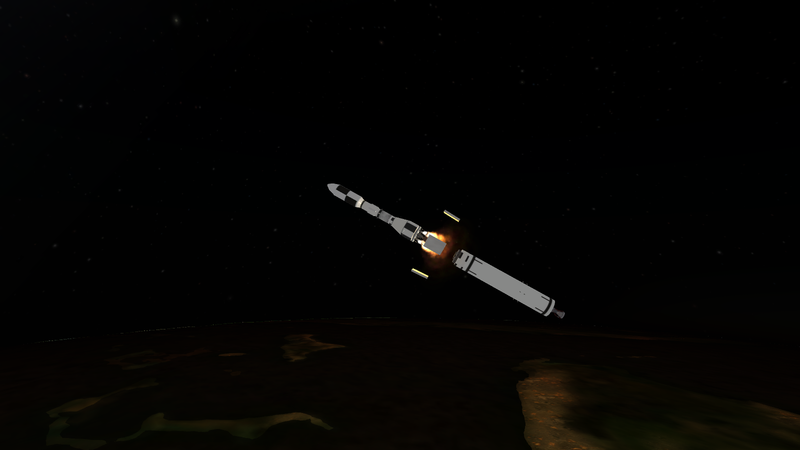 The upper stage takes a while to burn through its hypergolics, but the second stage places the spacecraft in near-orbit, just leaving the third stage to make the final push. Which it totally failed to do. 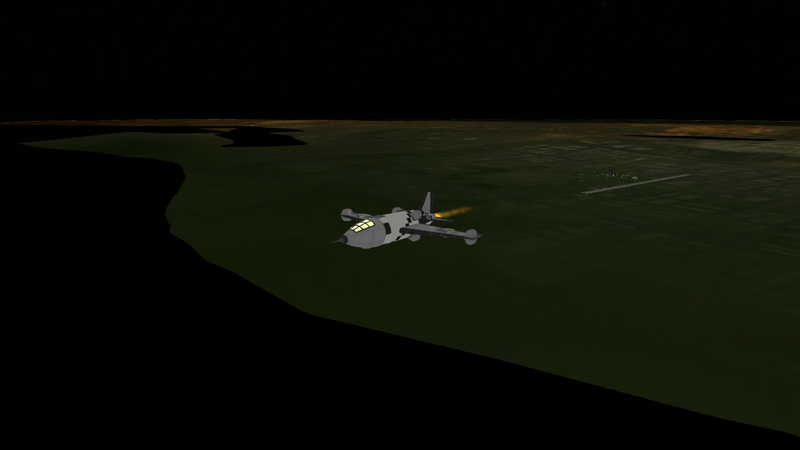 Somehow, the tankage had lost pressure, and the XASR - 1s failed to fire. Someone's going to get shouted at once we're done here. 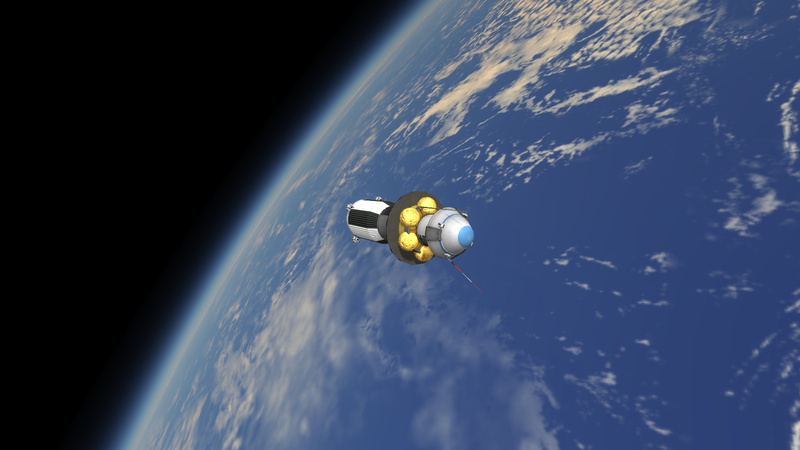 Anyway, the spacecraft has an Aerobee for itself, and we used it to put the spacecraft into the highest orbit we could achieve. 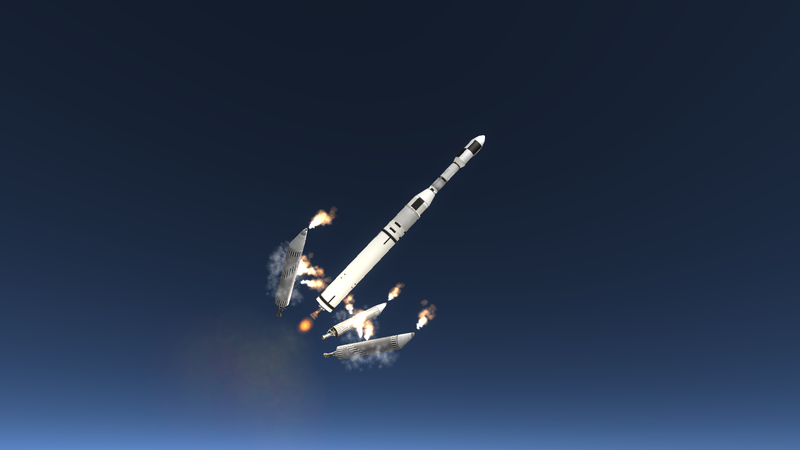 Now, someone find me the idiot reponsible for designing that third stage modification. I'm gonna warm up my tonsils. 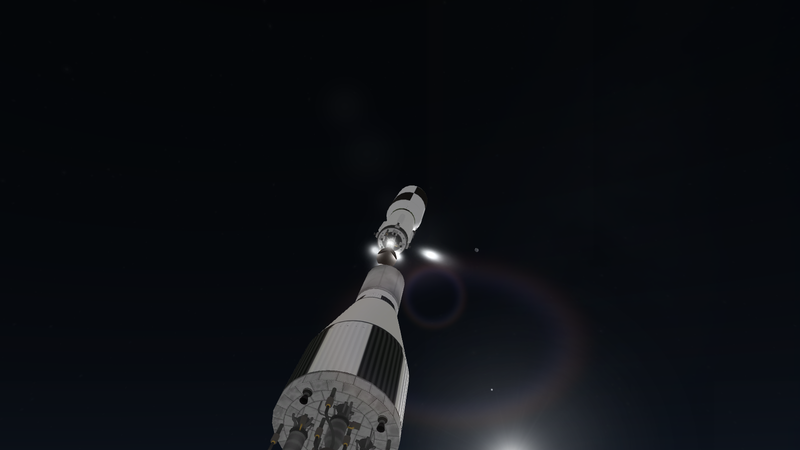 Mission: Try and put Zaltonic's satellite in orbit again. Well, we ought to attempt another launch of that commercial satellite. 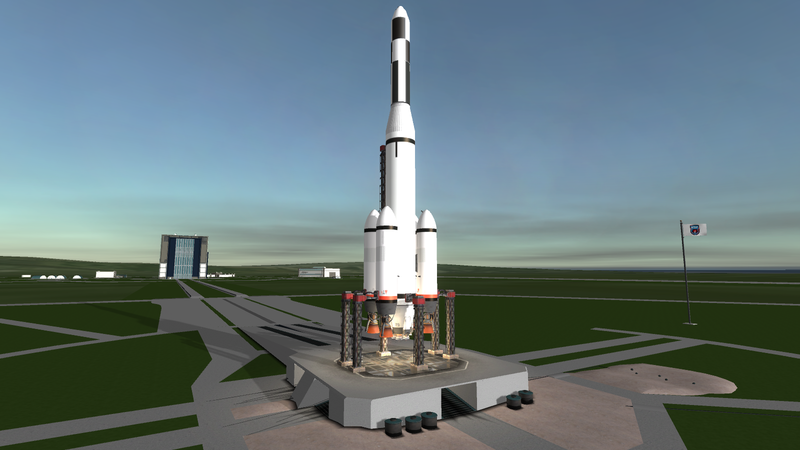 We'll also use it as a test mission for our new Launch Vehicle, the Devoid 1B. 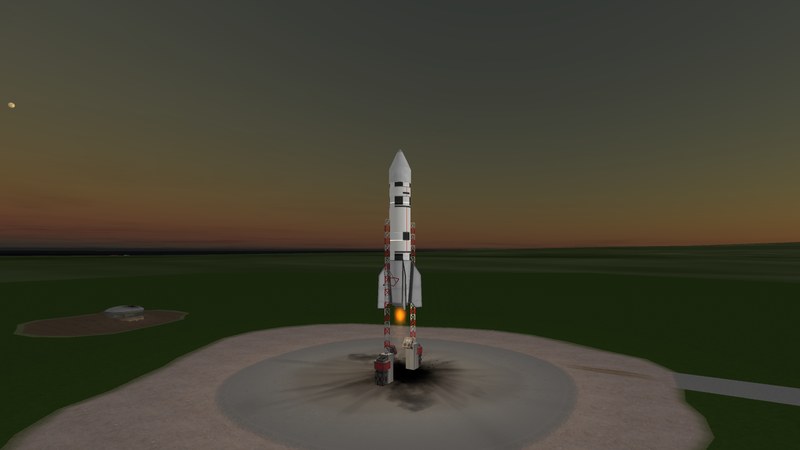 In an attempt to cure the low TWR of the third stage of the Devoid 1, we've imported a new engine from Britain, the Gamma 2, and replaced the third stage AJ-10 with it. And with that, we're off. What you're looking at there is an identical failure to last time. 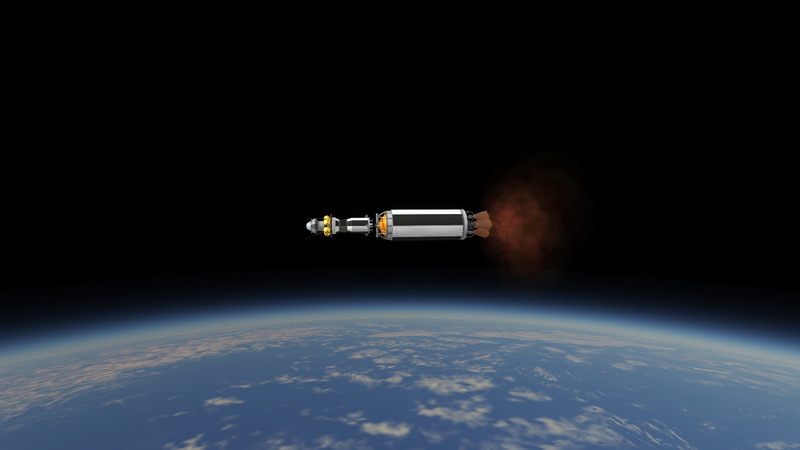 Well, the only thing for it is to jettison the booster and try to carry on without it. 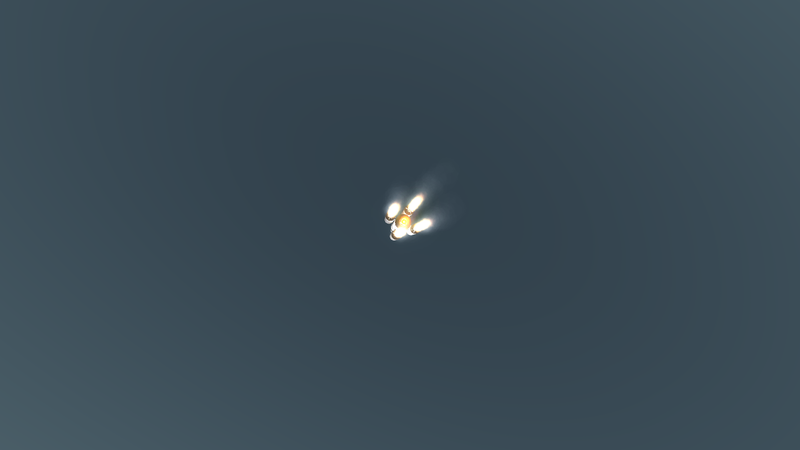 But it would appear that we've learned from our previous mistake, and we made it to booster sep on just three boosters. 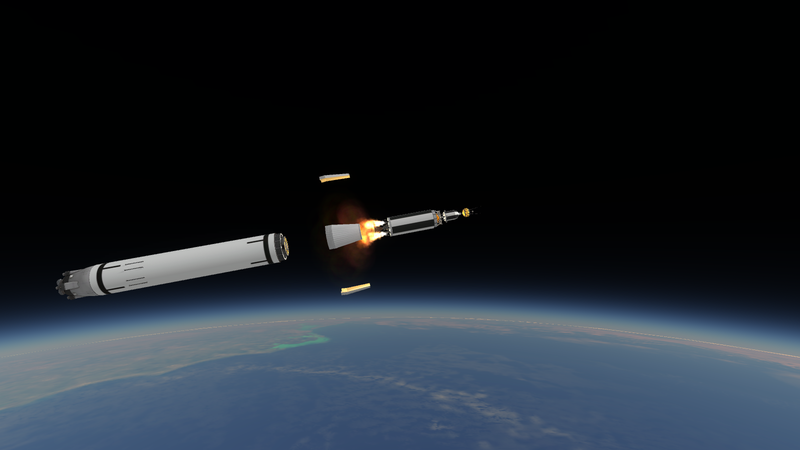 And on to first stage separation. You know, this might actually work! 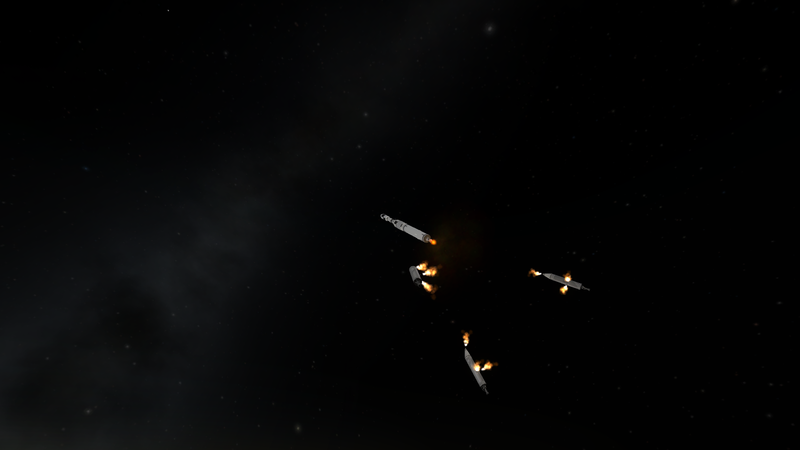 Well, we made it to SECO through a lot of skilled flying, and the Gamma 2 is firing (although you'd be forgiven for not thinking so). As I forgot to take screenshots over the next few seconds, I suppose that I'll have to tell you what happened. 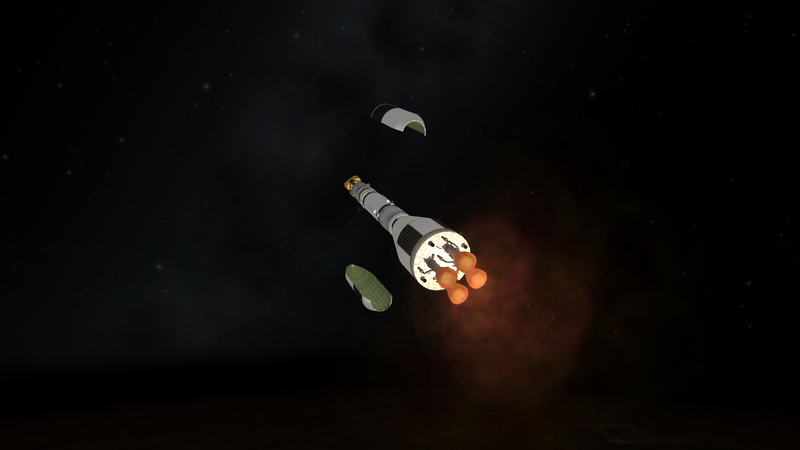 One of the XASR - 1s failed while I wasn't looking, and the probe spun itself to disintegration. I told you that this mission was cursed. Hell, perhaps this whole contract is cursed. 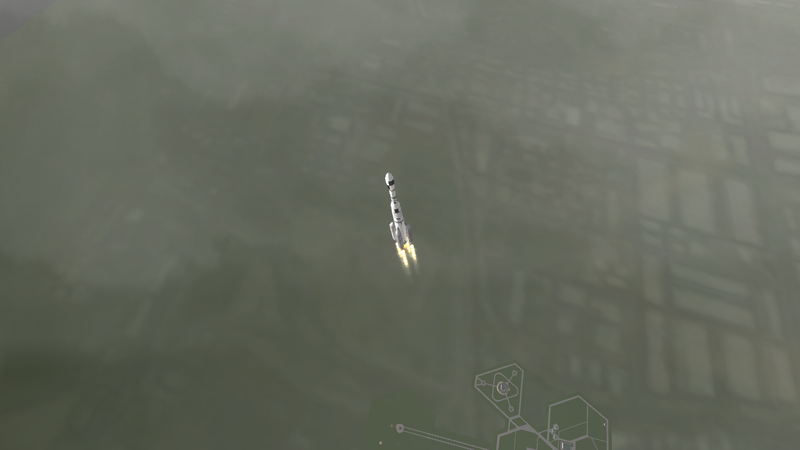 We've sacrificed two fairly expensive boosters to it already. Location: Live Long and Prosper! Let me tell you something. The engineers are the ones behind it. They are the ones behind EVERYTHING. 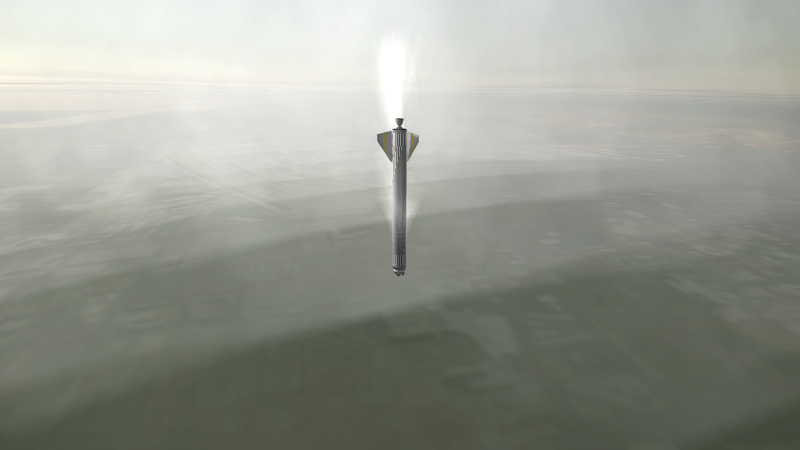 They purposefully have been ruining your rockets because Ussari has paid them well. Even the most loyal engineers can be turned by the color of money...........Beware of the engineers. I told you that this mission was cursed. Hell, perhaps this whole contract is cursed. We've sacrificed two fairly expensive boosters to it already. I'll try the mission once more, but after that the contract will expire.